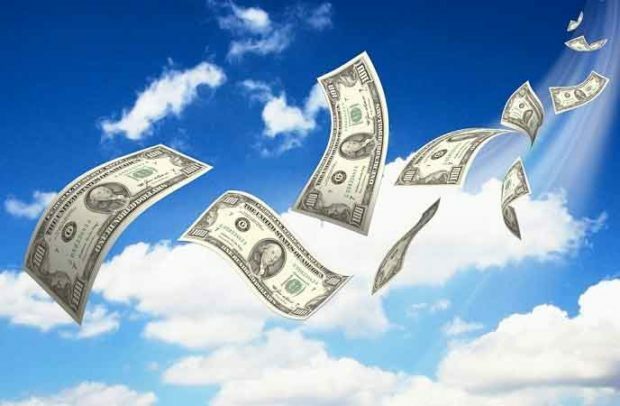 We had a very good month in March, spending wise. Right until the last day, that is. February ended with a daily spending average of $56.93, with nearly $200 in spending over our monthly budget amount. 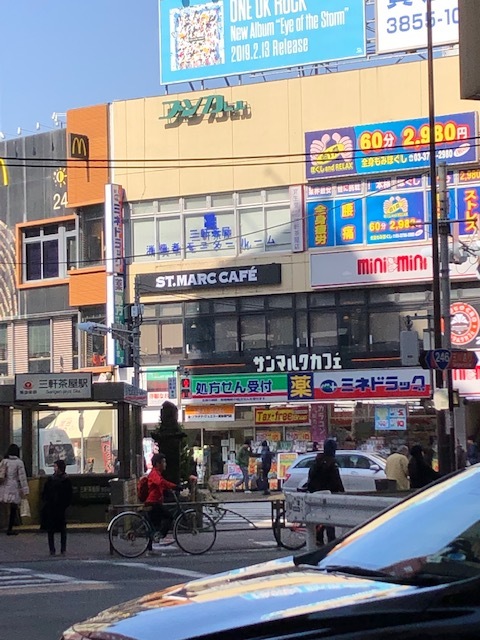 We were determined to be more careful in March, and by March 30 we had managed to get our daily average down to $44.39, which included Meiling’s and her boyfriend’s arrival and our getaway to Odawara (our son took care of almost all our expenses there). And then March 31 happened. 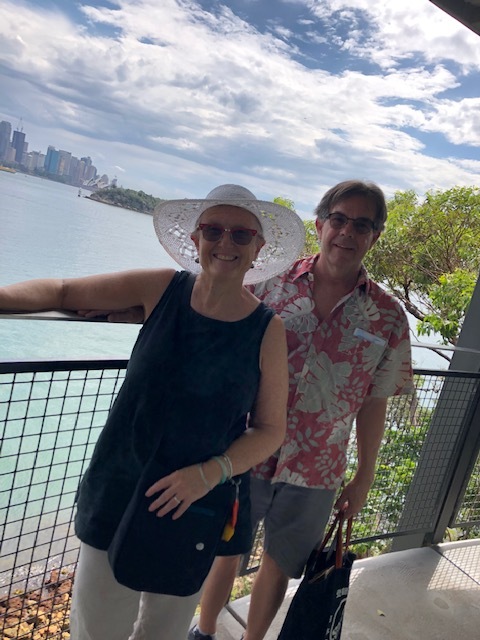 To celebrate our anniversary, and because we had two of our four children together who don’t get to see each other very much, we took everyone out to the Sunday Brunch at the New Sanno Hotel – six adults and one child (there was thankfully no charge for our granddaughter). And, following brunch, we went with Meiling to the Meiji Shrine and down into Harajuku where we treated all of us to crepes. On the way home we stopped in at the grocery store and bought some extra items for Meiling to bring home. Our spending for the one day ended up at $270.96 which brought our March average up to $51.69, and our daily average spend in Japan to $52.35. Ouch. We are not off to a particularly good start in April either, with our daily spend average right now hovering around $57 (the day at Disneyland didn’t help), but we have the rest of the month to get back on track. I think we can do it because other than Brett’s birthday this month, and Easter, there are no big events coming up, just small outings and trips for groceries for the two of us. We shopped at the discount grocery store this past weekend and saw a considerable difference in the amount we paid, so that will help. Fingers are once again crossed that we get through this month under our desired average of $50/day. Gotokuji Temple is believed to be the place where maneki-neko originated. 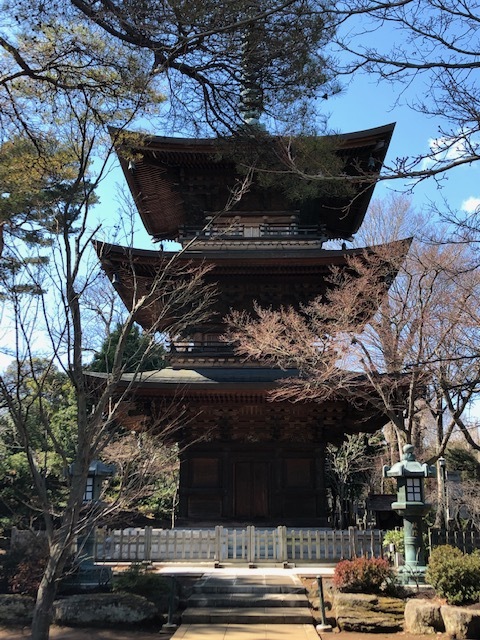 It took us three tries this week, but Brett and I finally were able to visit Gotokuji Temple, located just a short distance away from our apartment by train and on foot. We initially set out for a visit on Wednesday, but had a disagreement over getting to the station that heated up to the point that neither of us was in a mood to go anywhere with each other that day (sigh). We got that settled though, and were ready to try again on Thursday, but just as we were heading out of the apartment the heavens opened up, so not a good day to be outside visiting a temple. We went over to our son’s instead. But, this morning we woke up to blue skies and warmer temperatures, so off we went! 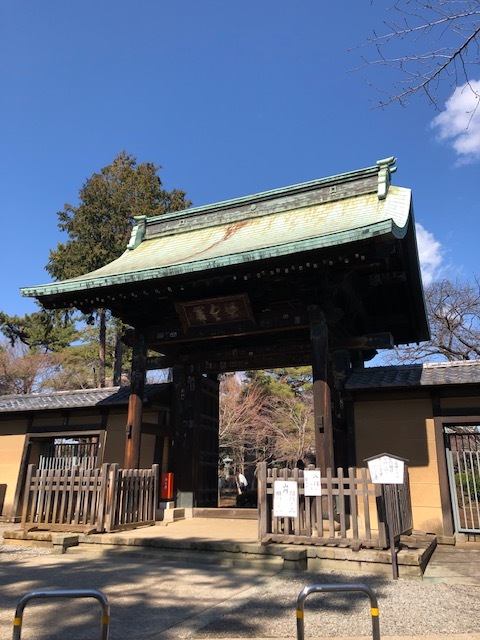 The Senmon (main) Gate of Gotokuji. 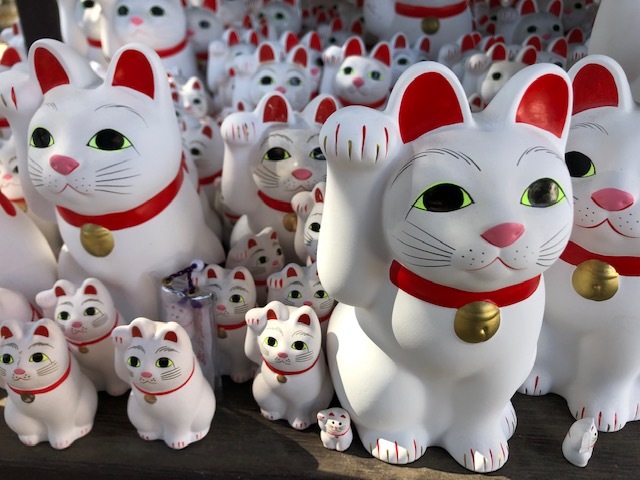 According to Japanese legend, Gotokuji Temple is where maneki-neko (lucky cats) originated. During the early Edo period (1603-1868), one night a cat supposedly led a feudal lord to shelter at this temple during a fierce thunderstorm, beckoning with its paw to show the direction. 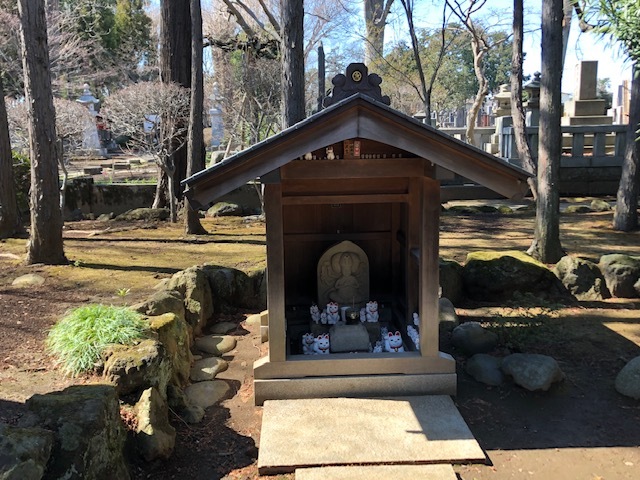 Because he was able to stay safe and warm during the storm, the lord donated rice and land to the temple, and chose the Gotokuji cemetery for his family burial site. Later, it began to be said that the cat brought good fortune, and it was given the name of maneki-neko. These days maneki-neko cat figures always have one paw raised to beckon, either the left or right, but Gotokuji specializes in the lucky right-pawed version of the cat. 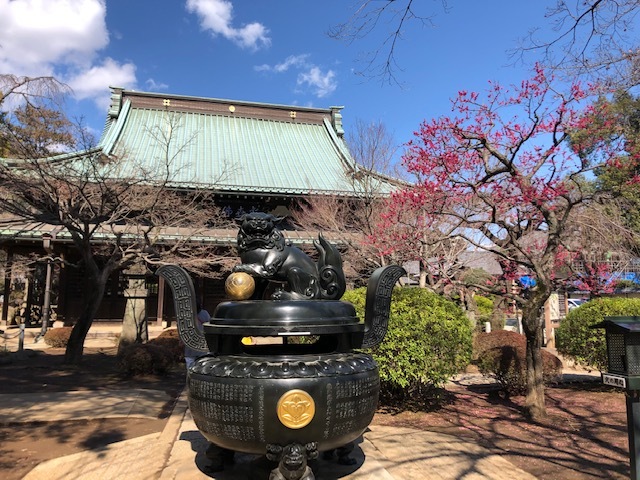 A large bronze vessel sits in front of the main temple. 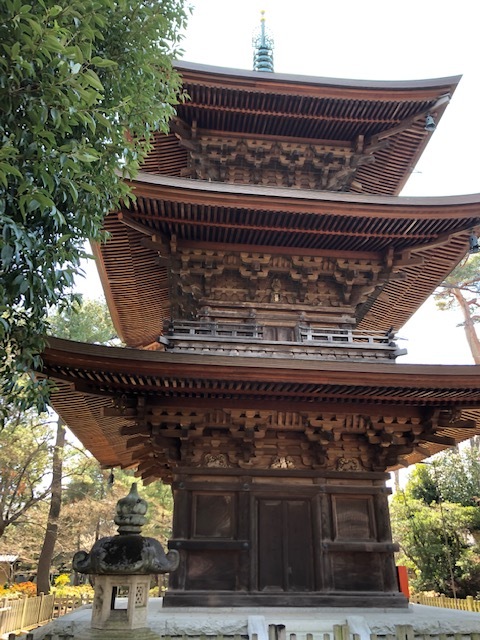 The beautiful pagoda – the sight of one always make me catch my breath. A look under the eaves of the pagoda shows the amazing woodwork and design of the roofs. We were a bit surprised by the size of the temple and its well-tended grounds when we entered – we had been expecting something much smaller. The temple complex contained several buildings, including a towering pagoda, the main temple, a meeting hall, a temple shop, and several smaller temples and pagodas. We were not the only visitors either – there were also a few other small groups while we were there. One of two large boards hung with ema (prayer boards). The little boards are stacked several deep. Each ema was adorned with a picture of a maneki-neko, and many also had a pig (boar) because it’s the Year of the Pig. Prayers or requests are written on the back of an ema and left at the temple to be carried to heaven. Bad fortunes are tied to the branch of a pine tree and left behind at the temple; good fortunes are taken home. 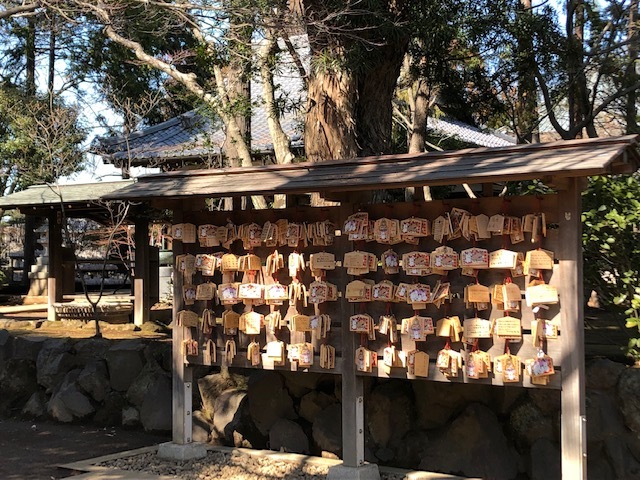 Walking over to the cat temple we spotted two large boards where hundreds ema (prayer boards) were hung, each with a picture of a maneki-neko on the front. 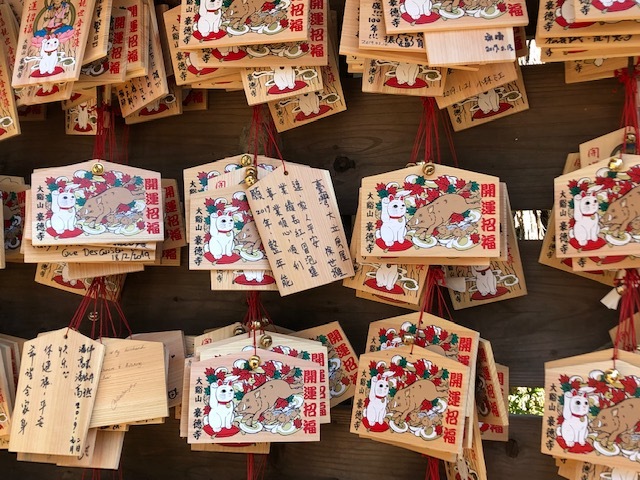 Visitors purchase a board, and write their prayers and wishes on the back to leave at the temple – these can include requests for healing, to pass a test, to get a promotion, to have a safe childbirth and so forth. 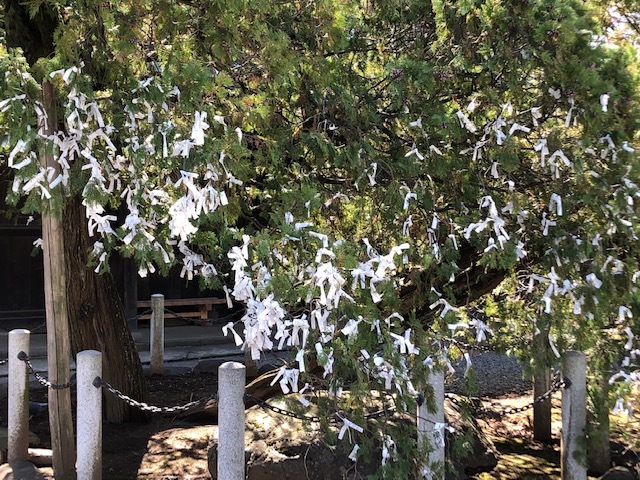 There was also a small pine tree with omikuji (fortunes) tied to the branches. Good fortunes are taken with you, bad fortunes are left behind at the temple. Maneki-neko figures ranged in size from large to very tiny. A small shrine is being engulfed by maneki-neko figures, but room has been made for a few more down in the lower left. 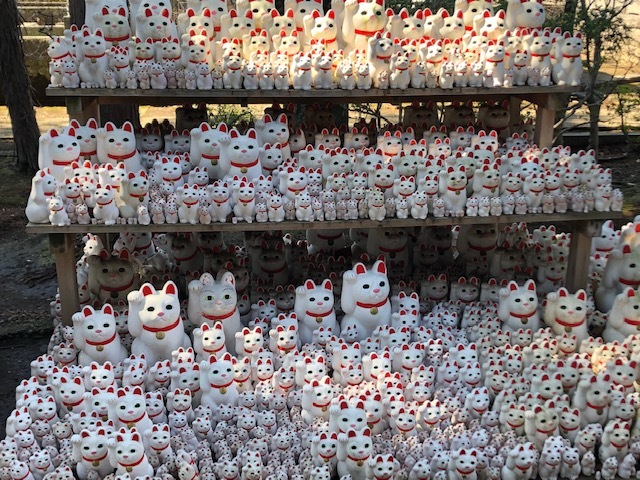 We finally came upon the collection of maneki-neko figures – there seemed to be more than a thousand of them arranged at the side of one of the smaller temples, and seeing them all together was quite impressive. 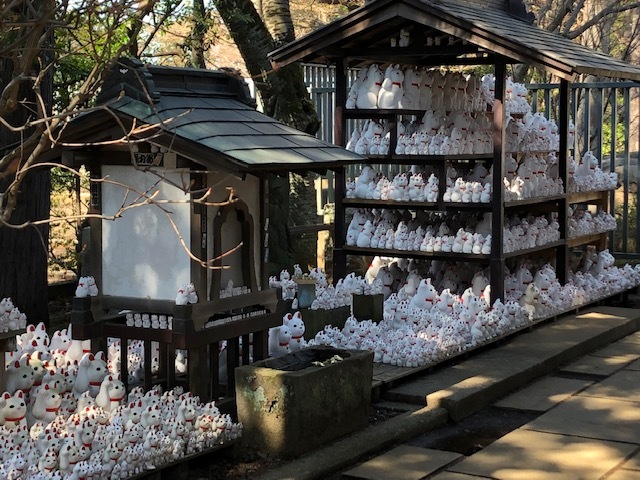 The maneki-neko figures ranged in size from large to extremely small, and most were neatly arranged on wooden shelves provided for them, but others were tucked into small shrines or even into the big stone lanterns around the temple. 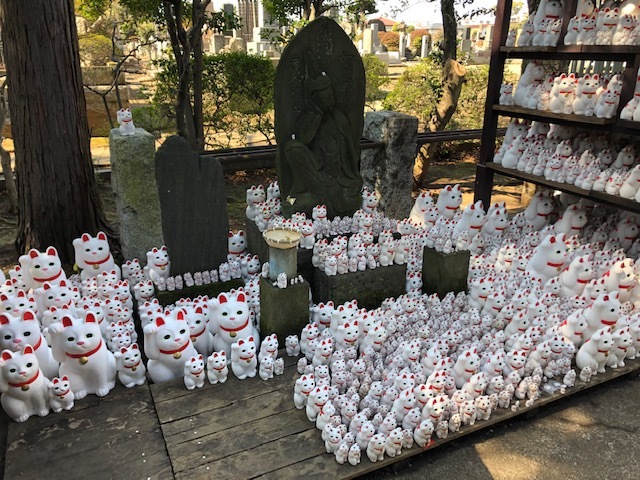 The cat figures are purchased at the temple shop, and visitors can either leave their figure at the temple (along with a wish) or take the figure home and return it to the temple when the wish has been fulfilled. Smaller maneki-neko figures were also placed in and around small shrines or inside lanterns. The entrance to the Gotokuji cemetery. Beside the temple is its cemetery. 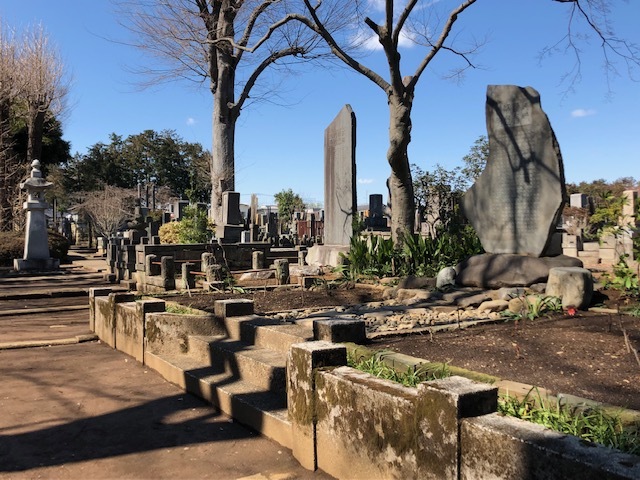 Usually cemeteries are closed in Japan, but this one was open. Filled with towering trees, it looked very peaceful and interesting, but we decided not to go in. Our train arrives to take us home! 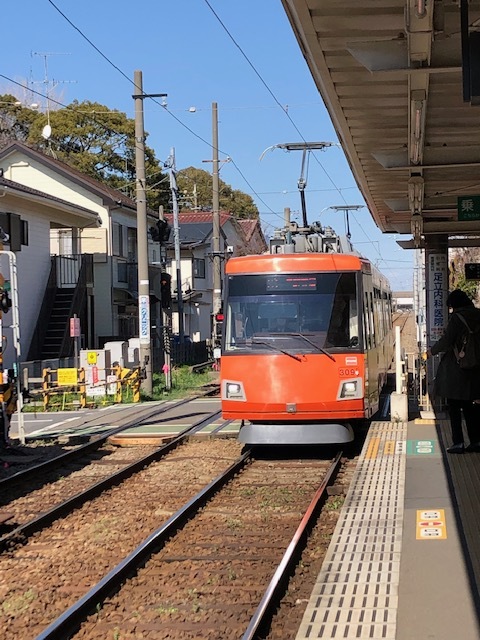 The line was really more like a tram with just two cars, and which wove though mainly residential neighborhoods versus stopping in commercial areas. We were pleasantly surprised to discover it was just a short walk back to the station from the main gate as we had accidentally gone the long way around the back of the temple when we arrived. Before boarding the train Brett and I stopped at the convenience market next to the station and picked up a couple of bentos to have for dinner. We left almost feeling glad we had failed to make it to Gotokuji earlier in the week as we ended up getting to visit on what turned out to be the perfect day for it. First task today was to figure out how to get to our subway station (that’s it over on the left). We are so happy to finally be in Japan! While we have had a wonderful time since we began traveling last August, our arrival in Japan has felt a bit like coming home. Not only are we thrilled about being nearby to our son and his family again, but we’re going to be here long enough that we can fully unpack our suitcases and live somewhat like “normal” (whatever that is) for a while. We still haven’t a clue what most anything around here says, and we’re just getting started figuring out our way around in a new area of Tokyo for us, but it’s so wonderful being in our favorite country in the world once again. We’d still move here in a heartbeat if we could. 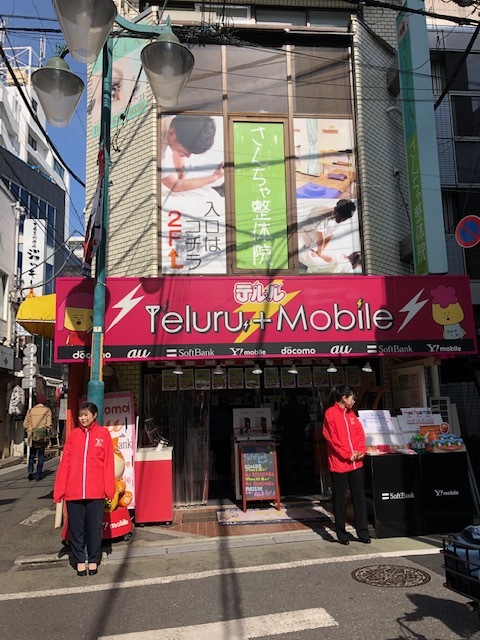 As we walked around our neighborhood today I took pictures of stores located at key locations – I still navigate best in Japan using landmarks since I’m otherwise mostly unable to read anything here. We left started for the airport yesterday at 6:00 in the morning. It was pitch dark when we left our Airbnb and since I couldn’t see the two small steps in the pathway out to the street I of course stumbled and fell. It was very painful and at first I couldn’t get up because I was so twisted around, but Brett helped me stand and assess the damage. I thankfully didn’t break or sprain anything but I did bang myself up pretty well and have the bruises and scrapes to prove it. How Brett got down those steps without falling when he was taking out the two heavy suitcases to the car was nothing short of a miracle. 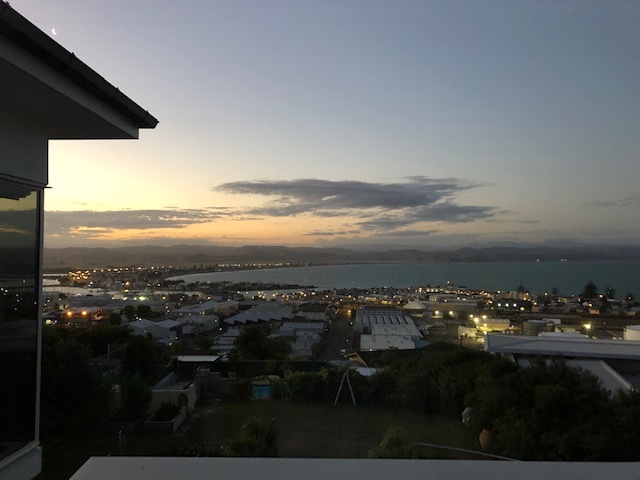 We had hoped that by leaving early we would avoid Auckland traffic issues but it was not to be – there was an already heavy amount of cars out on the road. The signage to the airport was very confusing as well, but we eventually found our way, got our car turned in and ourselves to the airport. We got in line and checked our bags and got our boarding passes, and departed Auckland a little after 10:00 a.m. It was a long flight (nearly 11 hours) but our seats were OK and we were fed two meals with an ice cream break in the middle. The flight also had a fantastic movie selection which helped pass the time (we both finally got to watch Bohemian Rhapsody). Our daughter-in-law had everything ready for tacos when we arrived last night, as well as a couple of appetizers, and fresh strawberries for dessert. 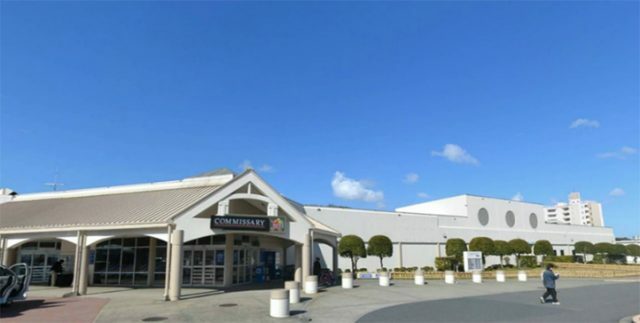 Arriving in Narita Airport is convenient to nothing but the town of Narita, and there’s generally around two hours of commute time to reach any destination in the Tokyo area. 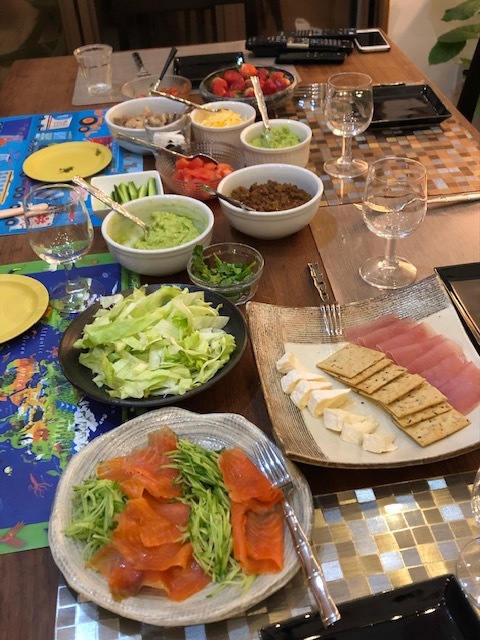 Our son was at the airport to meet us, and got us on an express train (NEX) into Tokyo followed by a taxi ride to his beautiful new house where our daughter had a light dinner waiting for us. 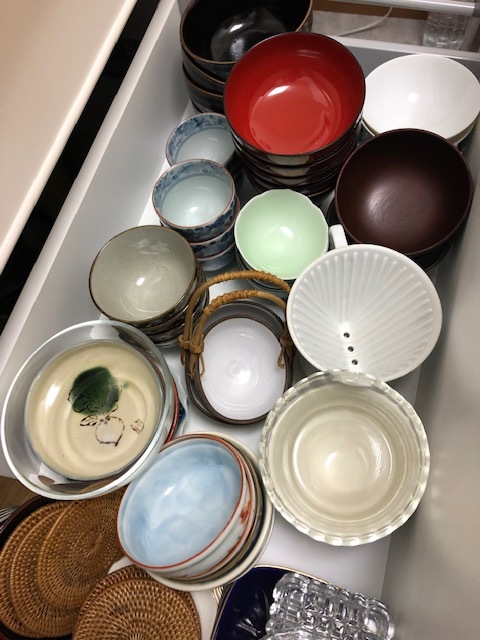 The kitchen has an incredible assortment of Japanese dishes – this drawer is full of teacups, bowls and small plates. Our apartment here is very nice, but it’s going to take us a few days to figure some things out, like the washing machine. We have a nice, well-equipped kitchen with loads of dishes, a very comfortable bed and a good-size living/dining room. The bathroom isn’t the most modern (it sadly doesn’t have one of those fully-automated toilets) but it’s very clean and has a traditional Japanese bath for soaking which we’ll enjoy. 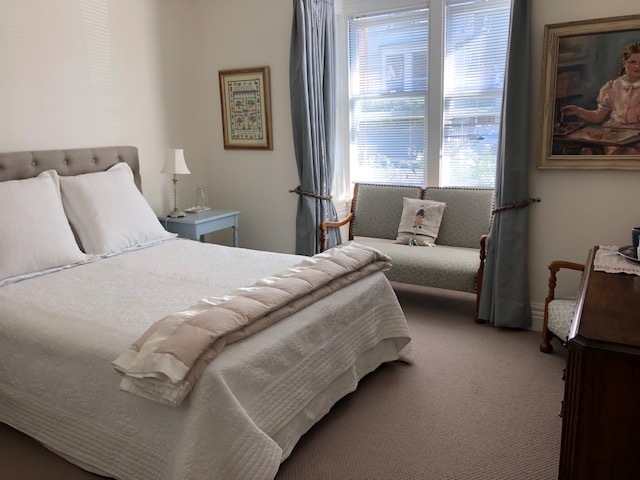 The apartment and the building are very secure, and just a short walk away from shops and restaurants. 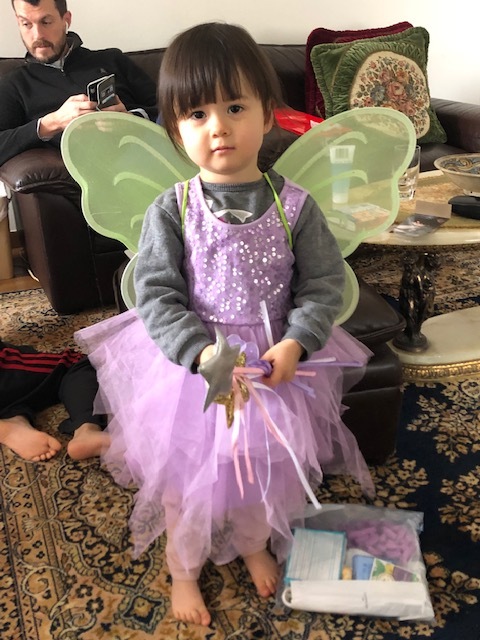 Our granddaughter in full fairy princess mode. She loved the dress and wands but was not too sure yet about the wings. We’ve already been having a grand time with the grandkids. The first thing our grandson (C) said to me was, “Grandma, you look thinner than you used to.” I love that boy! It took just a few hours for our granddaughter to decide we were OK and could pick her up or hold her hand when walking. Lunch today came from Mos Burger, a Japanese chain that serves regular burgers as well as ones that appeal to more traditional Japanese tastes. 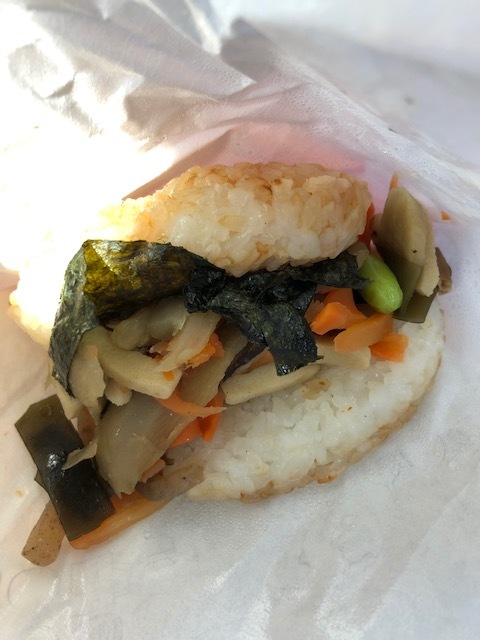 My “burger” had a toasted rice “bun” and was filled with a medley of Japanese-style vegetables and seaweed instead of lettuce. It was very tasty – I’d order it again. Some of our Japanese favorites from the supermarket today include miniature KitKats (including two new flavors! 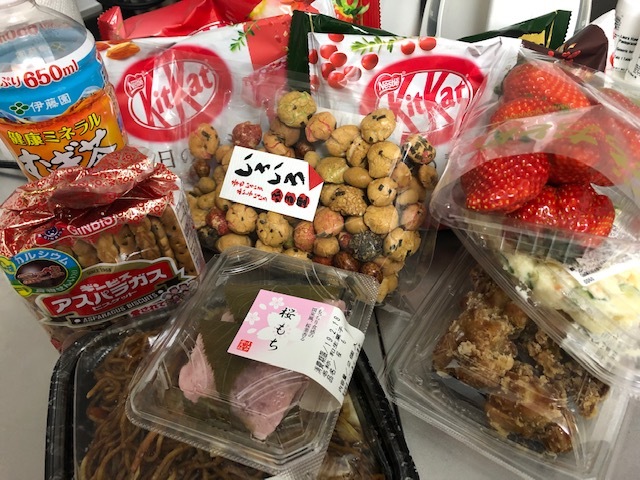 ), peanut crackers, asparagus cookies, sakura mochi, giant strawberries, Japanese fried chicken and potato salad, yakisoba, and roasted wheat tea. We had lunch at our son’s this afternoon and then went out with him to find an ATM that would accept our American debit card as they are often rejected, even by bank-owned machines. Today the ATM in our subway station refused the card but another one located in the back of a nearby minimart (owned by the same bank) worked fine – go figure. After we had some cash, Brett and I then headed to the supermarket with our grandson to do our first round of grocery shopping. C read labels, asked employees where to find things or translated what people were saying to us – he did a very good job and was a huge help. I absolutely ❤️❤️ Japanese supermarkets, and we had to make an effort to keep from buying too much. We chose some yakisoba from the prepared food section for our dinner tonight, and are otherwise set for the next week or so. Tomorrow our son is taking us out to the navy base so we can get some American items from the commissary and exchange, including plenty of Diet Coke for him. Finally, it is definitely winter here. After three weeks of hot summer weather in Australia and New Zealand, we arrived to temperatures around 40°F (or less – there had been snow earlier in the day). We had our coats with us coming off the plane, but today the scarves, hats and gloves came out as well! The apartment was also extremely cold inside when we first arrived, but with our daughter-in-law’s help we got the heater working and now we’re toasty and comfortable. Here’s hoping the next few months will not go by quickly! 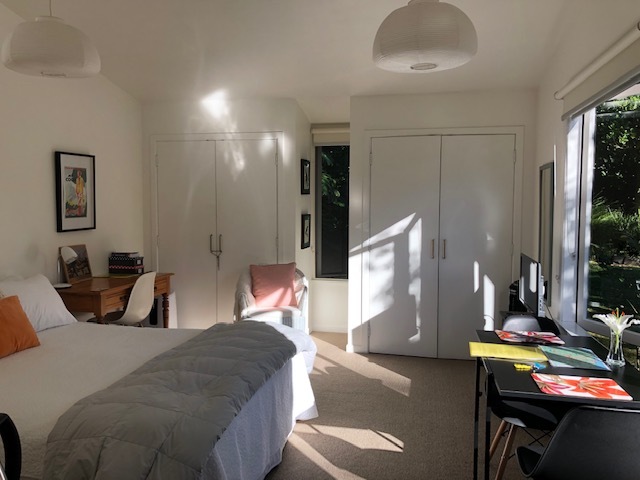 It was difficult to leave our Airbnb in Wellington – our host was a delight and the room cozy, comfortable, and in a great location. 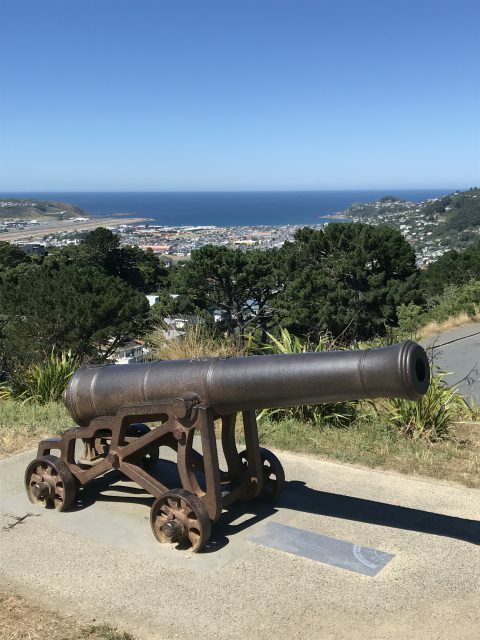 We left Wellington at 10:00 a.m. the day before yesterday, which turned out to be good timing – there were almost no cars on the expressways, and before we knew it we were once again out in the beautiful open countryside of New Zealand. We have come to believe there are no straight roads in New Zealand, at least not outside any city’s limits. Once again the highways we traveled twisted and turned through fields, hills and mountains. It was all wonderfully gorgeous, but challenging at times for both driver and passenger. Brett often had to grip the wheel and pay close attention, and I had to work to keep myself from being flung from side to side of the seat with each turn. The speed limit on New Zealand state highways is around 60 mph, although it goes down for some curves (down to 20 mph for sharp or hairpin ones), and passing lanes are frequently provided when going uphill so that no one gets stuck and frustrated behind slower cars and trucks. 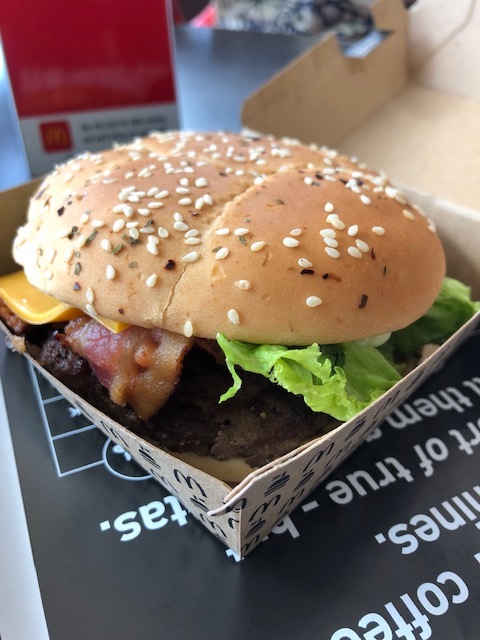 My first McDonald’s dining experience in more than 20 years turned out pretty well – my “gourmet” New Zealand burger was quite good! We passed through a few small towns on our way to Mangorei, and at one gas station’s minimart we discovered real Diet Coke in the cooler! Oh, how it had been missed! I also found Golden Fruit cookies there, a childhood favorite no longer made in the U.S., and we also picked up a package of Gingernuts, extra crispy gingersnaps made for dunking. We snacked on those a bit but at around 2:00 in the afternoon we were growing hungry and decided to stop for lunch. As we drove through the first town we came to the only place we could find was a McDonald’s, and as it was quite a ways to the next town we decided to stop there for lunch. I cannot even count the years since I last ate in a McDonald’s (over 20 at least except for a teriyaki burger when I’ve been in Tokyo), so I was a bit wary, but I was able to order a freshly made “gourmet” burger with locally-raised New Zealand beef on a special bun. It was very good! The only thing that could have made it better was if they had used real cheddar instead of the American cheese-like stuff, but still I enjoyed my meal. Brett had a fish sandwich and a coffee and called his meal good too. Mt. Taranaki rises off in the distance. In the winter it’s snow-capped, and locals ski there. It was shortly before lunch that we first spotted the large volcanic cone of Mt. Taranaki (8,261 feet) off in the distance. Our Airbnb was located up on the side of the mountain so we knew we hadn’t too much longer to go to reach our destination. Our Mangorei Airbnb sat up on the side of Mt. Taranaki, in a forest. Just 500 feet above where we were it transitioned into a rainforest. The view to the west from the house looked out at the ocean, and at night we could see the lights of New Plymouth. The Airbnb we stayed in couldn’t have been in a more beautiful location. 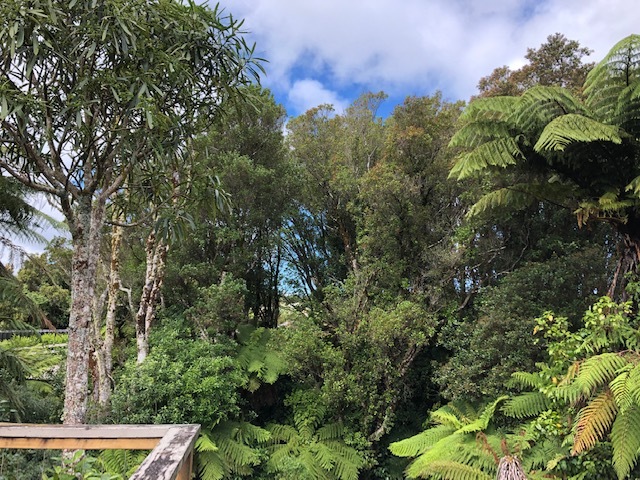 The home itself was gorgeous and sits inside the mountainside forest, with views up to the rainforest above, and out to the ocean the other direction. The house and bed were very comfortable, the owner an interesting man we enjoyed chatting with, and we had a good rest there for the night. 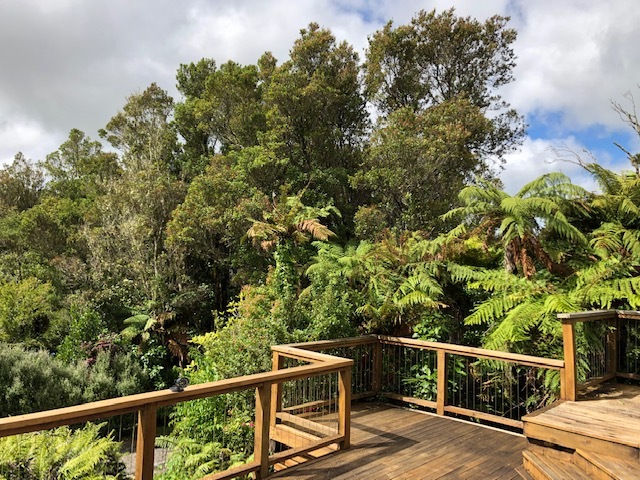 The house had decks on three sides, with gorgeous natural views from each one. We were up and on the road again by 10:00 a.m., and were expecting an approximately five-hour drive to Auckland. 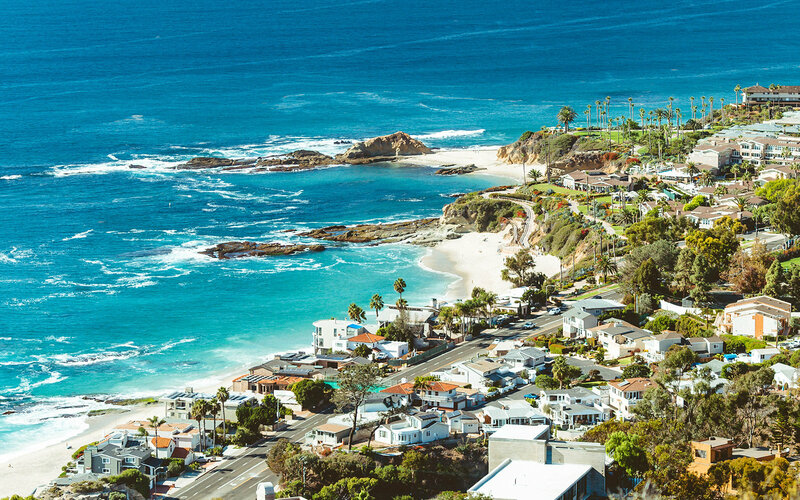 We headed out to the coast and drove along by the ocean for a while, enjoying all sorts of beautiful views before turning into the center. We soon found ourselves heading up into the mountains, traveling through a rainforest before moving into pine forests, deep valleys and fields of grazing cattle. While down in one valley we we were notified there was roadwork ahead and to “watch for queues.” Soon enough we found ourselves at the back of a l-o-n-g line of cars and trucks on the valley floor that had obviously been sitting for quite a while as engines were shut off and people were out visiting with others while they waited. We shut off our car as well and sat there, but after about 25 minutes we noticed cars coming down the mountain from the other side, and 10 minutes later it was our turn to start over the mountain with a slow, very winding climb up to the top. We discovered the workers as we got near to the summit, apparently repaving the passing lane. At that point pretty much everyone was stuck behind several slow-moving trucks but could not pass any of them – frustrating! I finally got to try a New Zealand pie – they were in shops and minimarts everywhere we stopped, but this one was freshly made, and filled with tasty seasoned ground beef and cheese. The crust was incredibly flaky. Of course what goes up must come down, and we had a wild, winding ride back down the other side of the mountain on our two-lane road, behind the trucks that now kept having to put on their brakes so as not to fly off the road – it was a nerve-wracking piece of travel for both Brett and I. We eventually made it to the bottom and noticed that the line of cars and trucks on the other side now waiting their turn to go up and over was even longer than ours had been! Most of the vehicles that came down in our group stopped at the small town at the bottom of the mountain, but Brett and I drove on to the next town, Piopio, and stopped at a little cafe and bakery there. The food was freshly made and absolutely delicious. 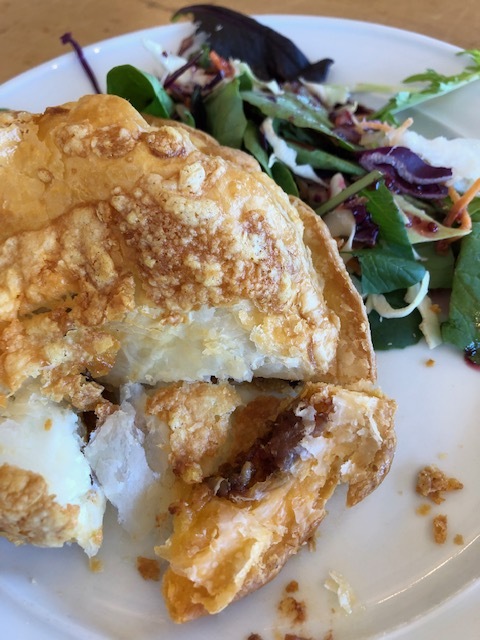 Brett had a bacon, egg and cheese sandwich, and I finally got to try a New Zealand mince and cheese pie. Besides the good food we also got a much-needed break before heading back out on the road. The journey from Piopio started out well, but a few miles away, near the junction between the highway we were on and the one we would take up into Auckland, we came to a complete standstill in a huge line of cars that went on for miles. Had there been an accident? For over an hour we moved along very slowly and eventually discovered that workers were repairing two lanes at once on a stretch of the road just past a roundabout that had cars entering it from three directions. The work had turned the roundabout into a complete bottleneck and caused massive traffic jams on all three roads! 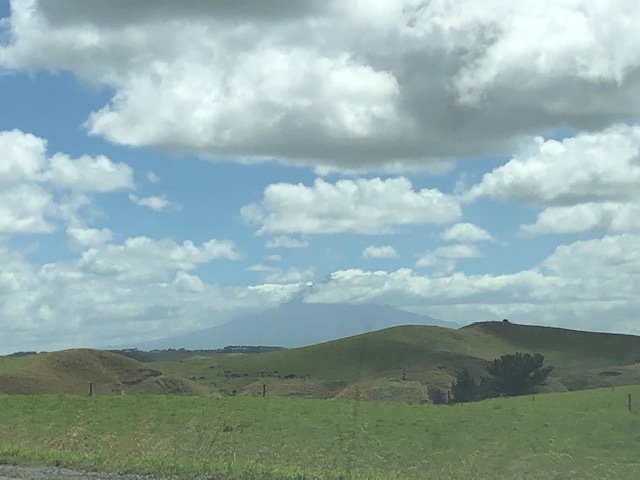 We finally got through that mess, and once again drove happily on our way to Auckland, feeling very smug at one point at the bumper-to-bumper traffic leaving the city while there appeared to be very little traffic going our way into the city. That smug feeling was wiped away though the closer we got to downtown. Soon enough, we were the ones stuck in traffic barely inching our way along. We crawled for another hour or so until we finally reached the exit that would lead to our our Airbnb. It was at this point that Google Maps decided once again to go nuts, and it pointed us in a direction completely opposite of where we needed to go. We finally got turned around and on our own figured out the route to the house. When we arrived it was after 6:00 p.m., and we’d been on the road for over eight hours. It was no wonder we felt so exhausted! I don’t think we were ever so happy to get to an Airbnb as we were when we arrived at our one in Auckland. 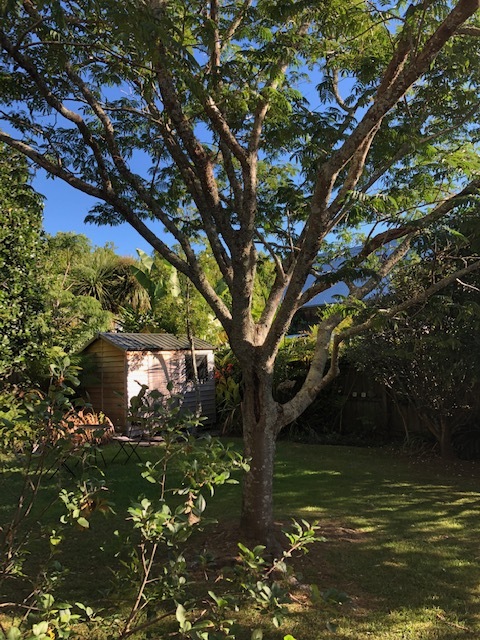 Our Auckland lodgings are beautiful and peaceful, and we decided that instead of pushing ourselves trying to get out and see things in town today we’d just hang out in the neighborhood and relax, and get ourselves packed and rested for tomorrow’s long flight to Tokyo (over 10 hours). We enjoyed a special Valentine’s Day dinner at a nearby restaurant earlier this evening, and stopped at a neighborhood bakery to pick up pastries for tomorrow’s breakfast. Thankfully the airport is only a 20-minute drive away, and at the early hour we have to be there to turn in the car there shouldn’t be any traffic. We enjoyed our last day of beautiful summer weather – it will be cold and wintery when we arrive in Tokyo (this is the view from our Airbnb window). One of today’s tasks was getting our winter and summer clothes switched around again. 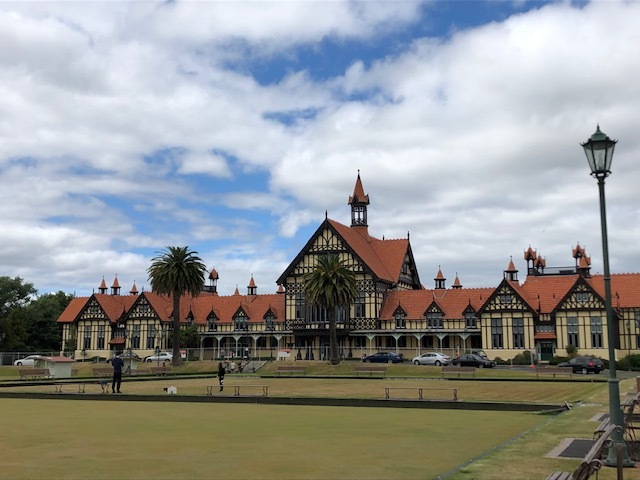 Our time visiting the North Island of New Zealand has been everything we hoped for and more. The scenery has been magnificent, and the people we’ve met along the way friendly and gracious. We’ve enjoyed absolutely perfect summer weather every day with no humidity. Over and over we were asked if we were going to visit the South Island, and received words of gratitude when we said we were sticking to the North. So many visitors just pass through, we were told, in a rush to get to the south, when the North Island has so much to offer and see as well. 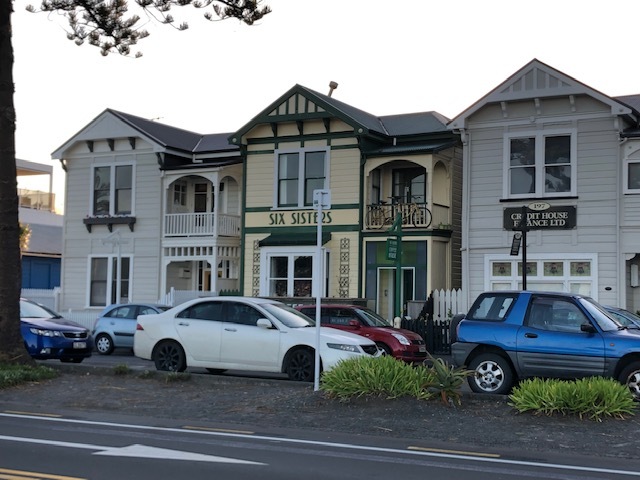 We have promised ourselves a visit to the South Island some day, and more time in Auckland as well, but for now we’ve had a fabulous time driving around in the North. It took us a bit longer than expected but Laura and I finally reached Wellington after numerous differences of opinion with Google Maps, which like a spoiled child kept changing our route in fits and spurts—the last faux pas encouraging us to take an exit we had already passed nearly four miles earlier. Some of the highway markings fell short of the mark as well, though admittedly I may have missed one crucial turn because it was blocked by a semi-tanker to my right. Getting back to Google’s new recommended route took us down the road to the longest place name in the world, Taumatawhakatangi­hangakoauauotamatea­turipukakapikimaunga­horonukupokaiwhen­uakitanatahu, and that’s the traditional 92-character spelling—according to Wikipedia there is also a 105-character version! 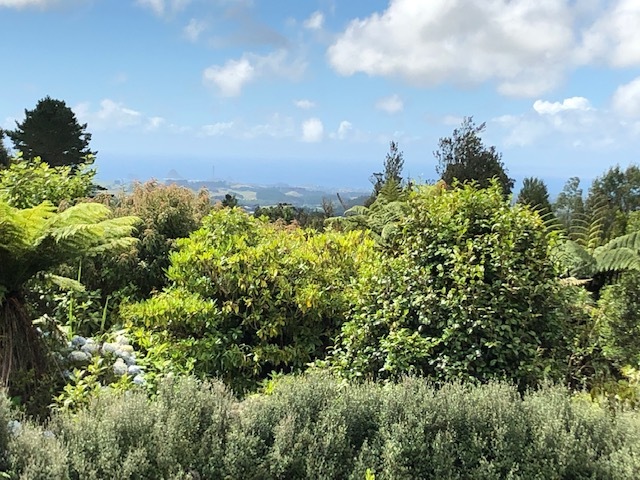 Laura had one more tussle with Google to get us from the end of the freeway in Wellington to our AirBnB location, and then everything was lovely. Not altogether lovely – I’m blogging because she was more than a bit under the weather yesterday and ended up spending most of the day in bed, and I set out in the morning to see the sights for us both. I first took care of a personal preference: a hike up to the lookout at the summit of Mt. Victoria, which rose behind and above our lodging’s location. It didn’t look like much of mountain, but its diminutive stature was radically offset by its steepness. My little health app indicated that I had ascended 31 floors on the 1.5 mile trek. One interesting point about Mt. Victoria is that there is a Lord of the Rings filming location here. Also found here is an abundance of widely recognizable, richly colored plants such as Sweet Pea, Queen Anne’s Lace, Giant Fern, and that thing with nasturtium-like leaves and morning glory-like blossoms. The trails are quite well marked, and the things you can see are worth the effort to sort out the occasional unmarked intersections. 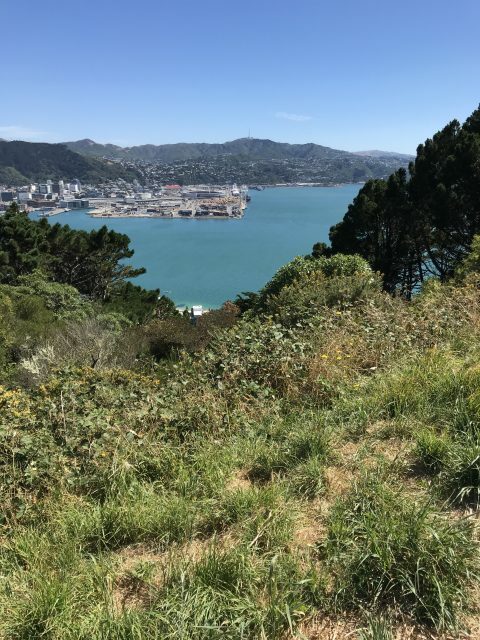 I enjoyed a stunning view of Oriental Bay along the way, and from the top, the other side of the world as it seemed, including the somewhat busy airport. After a brief stroll around the summit, I headed back down into town by a somewhat different route. To my surprise there was the piece of a set for “Lord of the Rings,” not exactly a hobbit house, but more like a wayfarer’s lodgings. I suspect children from the nearby playground have kept the hutch going all these years. Te Papa Tongarewa, the National Museum of New Zealand, was the next station on my trek, and looking back along the way I could see Mt. Victoria’s summit, where I had just come from. Although some of China’s terracotta warriors are currently on exhibit, I didn’t have the price of admission on me so I chose instead to look at some of New Zealand’s treasures that have been collected here. Once inside, I was first captivated by the story of the WWI battle of Gallipoli, vividly writ larger than life with photos, models of trench works, giant life-like statuary, and audio tracks. It was dreadful, knowing the eventual outcome of the battle (New Zealand lost 8,000 men) and also because it reminded me of brief moments during Operation Desert Storm: making every bullet count, eating canned meats, no one wanting to be taken out by a ricochet, and heartbreaking. Then it was up to the second floor to see exhibits of the origins of this part of earth that is now called New Zealand. From the beginning, the people were connected to the Earth, whenua (wh is pronounced as /f/ in the Maori language). 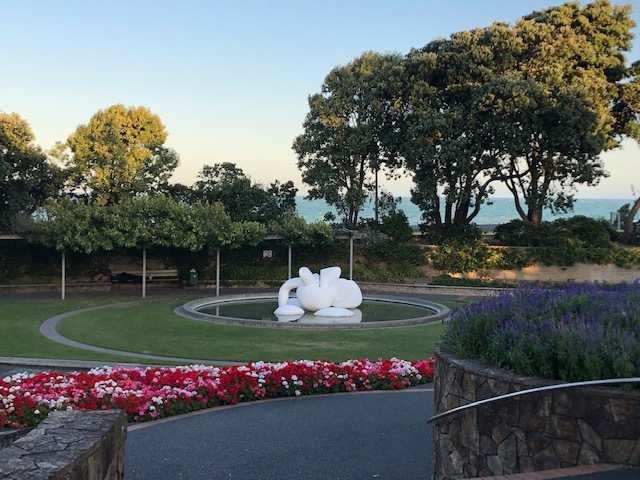 The placenta was also called whenua so the first people prepared an ipu whenua (afterbirth container), such as the replica on display, to return the placenta to the earth, thus maintaining the connection. From the beginning, the people used the Earth’s bounty as they pleased. Whenever resources ran low, they banned hunting, fishing, or harvesting to allow the resources to recover. A ban was established by erecting a pou rahui (post denoting restriction) to mark an area off limits, and the people respected the ban. Then came the Europeans, and they began clearing land, and marking their territory with a pou rahui, several actually, and stringing wire between the posts to “enforce a ban” on crossing the area. Ultimately, the Treaty of Watangi, signed 1840 by representatives of the British Crown and more than 500 Maori Chiefs became the founding document of a nation, a symbol of the unique relationship among people which continues to evolve today. There was more museum than I could see in an afternoon, so I headed back to our lodgings to check on Laura, who thankfully was feeling much better; good enough, in fact, that we went out for dinner at a nearby Chinese restaurant in the evening and enjoyed some very good chicken and sweet corn soup, cashew chicken, and egg fried rice, which also provided enough leftovers for our breakfast this morning before departing Wellington, a city we both agreed we had once again not spent enough time getting to know. 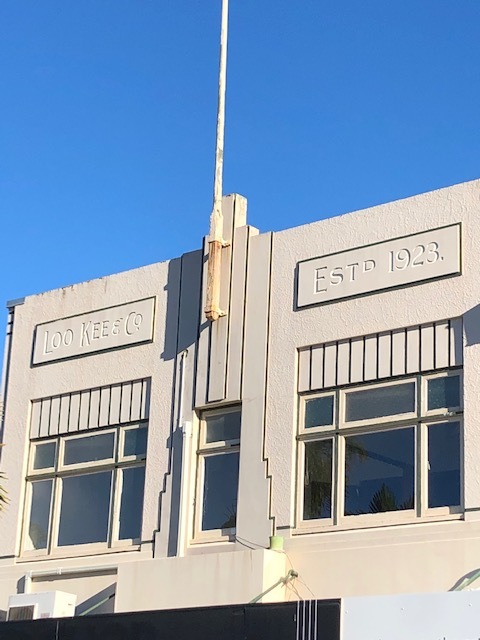 Napier is also known as Art Deco City. 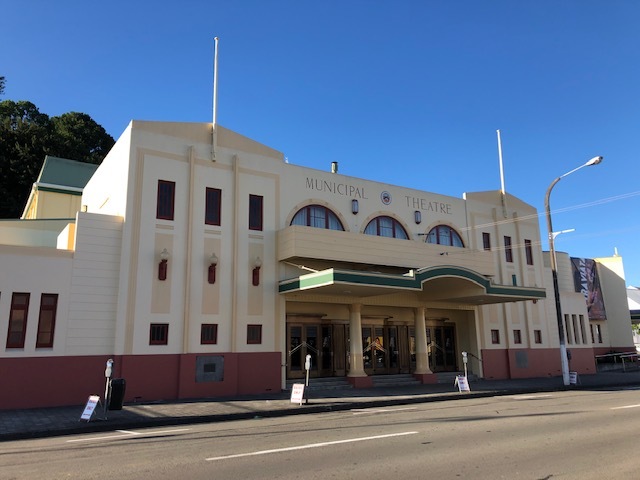 In our drive around New Zealand’s North Island, we chose to stop in Napier, located on Hawke’s Bay on the southeast coast, for two reasons: 1) We wanted a place to stop between Rotorua and Wellington (we’re hoping to keep our daily drives between four to five hours a day); and 2) We heard that downtown Napier has a collection of vintage Art Deco buildings that we wanted check out. 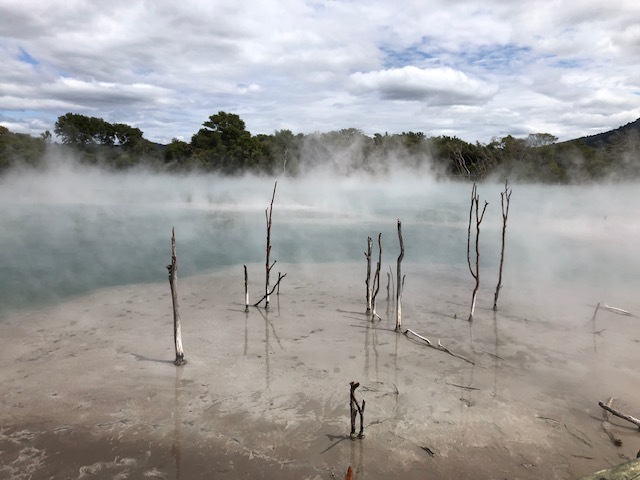 We left Rotorua about 10:30 in the morning yesterday, and had a lovely drive down to Napier, through rolling hills and lush farmland on a two-lane state highway. In the distance we could see mountains at times, some even with snow, but they eventually disappeared. We had also hoped to stop off and check out a couple of waterfalls along the way, but although we saw signs letting us know they were in the area, we never saw any other signs letting us know when to turn. Google Maps was no help at all either – it has not functioned well here in New Zealand. 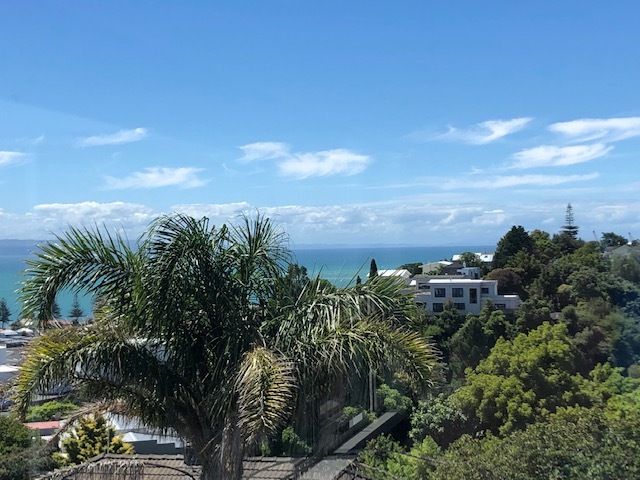 As we approached Napier though we came over a last set of hills and got our first look at Hawke’s Bay, chock full of sailboats out in its turquoise water, and loads of houses perched up on the bluffs above the town. The amazing view from our room in Napier. There is actually a huge cruise ship hidden behind the palm tree! It took us a couple of tries to find our Airbnb up in the hills – the streets were narrow, some were one-way or dead ends, and once again Google Maps let us down – their directions told us to go up a one-way street, and they left off information that we would need the ‘North’ side of a street versus one labeled ‘South.’ But, we eventually found the house, and when we were shown to our room, the view alone made all of the frustration of getting there worthwhile. Our first thought as we looked out at the incredible view was to wonder why we hadn’t booked the room for more than one night! Three of seven Victorian houses that survived the earthquake sit across from the waterfront park. These painted ladies now hold restaurants, shops and guest houses. After getting our stuff up to our room, we chatted with our delightful host for a while and played with their adorable little terrier, and then got directions for how to get down into town as well as some suggestions for where to eat dinner. 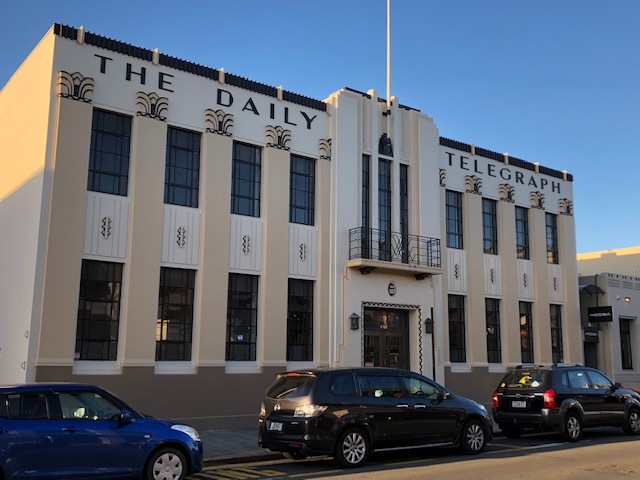 We turned out to be closer to the Art Deco district than we thought, and decided to start over at the waterfront, then stroll through the town and end with dinner. The park along the waterfront was a much nicer place to walk than down on the beach. There was a strong wind at the waterfront and lots of choppy water – definitely not beach weather. The beach was shingled (small rocks) versus sandy and didn’t look very inviting either. There’s a long park lining the beachfront, so we walked through that to a main street (Tennyson) that headed back into town. We had glimpsed a few of the buildings on the way to the waterfront and thought Tennyson would be a good place to start. This tower on the T&G building sat on the first corner we came to. 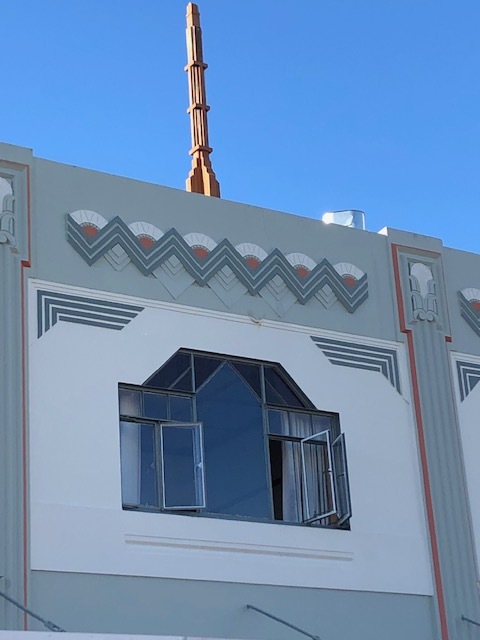 Art Deco has been my favorite architectural style for forever, and walking through Napier was like going through a box of exquisite jewelry. Almost every building was vintage Art Deco, built in 1933 after most of the city was destroyed by a large earthquake in 1931. Many of the buildings now house modern shops on the ground floor, with the vintage upstairs offices, apartments or sometimes left empty. All were well-maintained though with no peeling paint, etc. We must have walked around for an hour or so – every time we looked up, there was another masterpiece of the style. 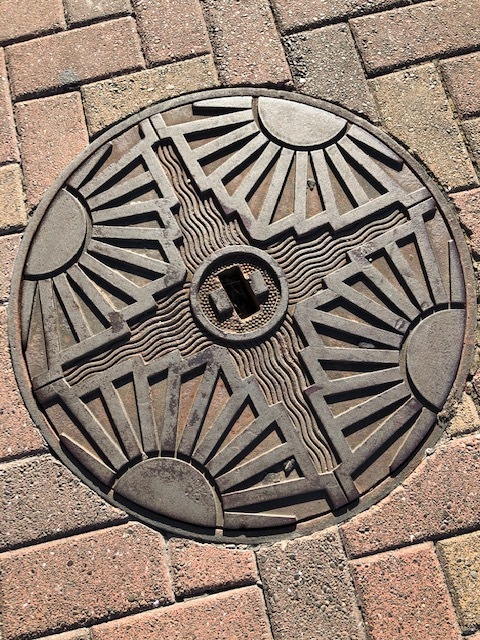 Even the street signs and manhole covers were done Art Deco style so as to blend in. A Chinese merchant’s building – next door was one of the few non-Art Deco buildings, a small place with a green Chinese-style tile roof, but we couldn’t find any name or connection to this one. 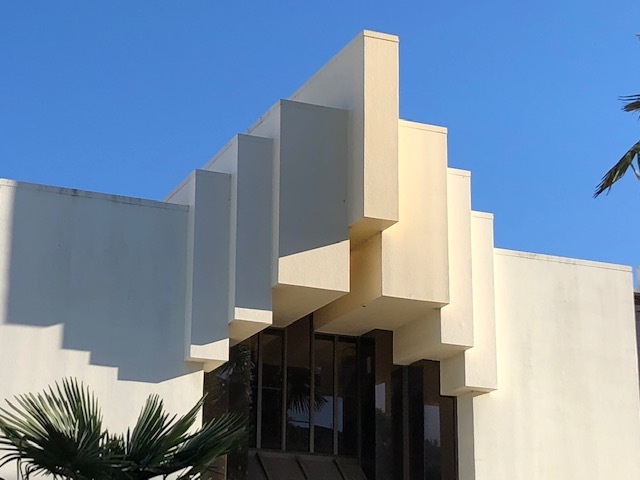 Does it get more Art Deco than this? The Municipal Theater was a masterpiece and is still in use – La Traviata will be performed there next week. We eventually made our way to a small Mexican restaurant, and managed to get the last available table (customers after us either had to sit at the bar or wait outside). We enjoyed some very tasty (and spicy) food and cool drinks, and then headed to our car and back up to our room to enjoy the view some more and relax. The bed during our stay in Rotorua was the most uncomfortable we’ve slept in during our travels (way too soft for us), but the one in Napier more than made up for it and we both slept soundly. The Mexican restaurant we ate at was in an old house that had survived the earthquake. 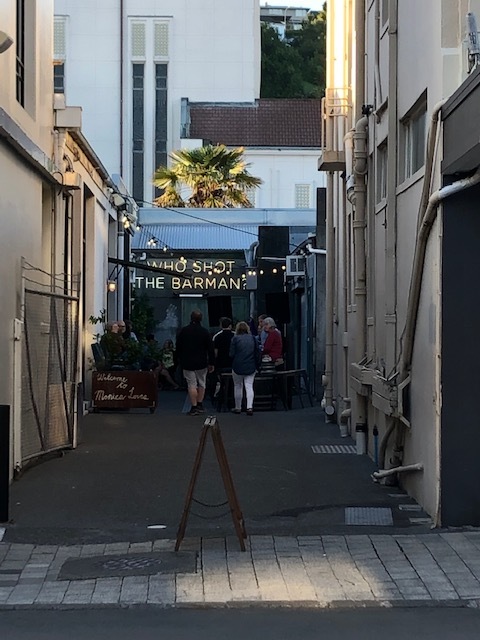 Hidden between and behind all the Art Deco was this tiny bar – loved the name! We had a beautiful sunset view from the second window in our room. 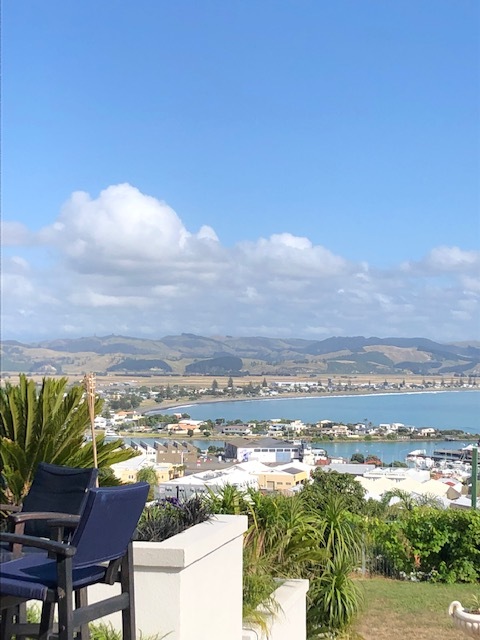 This morning we enjoyed coffee and breakfast out on the terrace with our host, enjoying the beautiful view for the last time before starting our journey to Wellington. It may have only been for one night, but we definitely found this Airbnb and the visit to the city one of the highlights of our Big Adventure! We enjoyed breakfast out on the terrace before we departed Napier this morning. Dwarfed by the trees in the Redwood Forest. 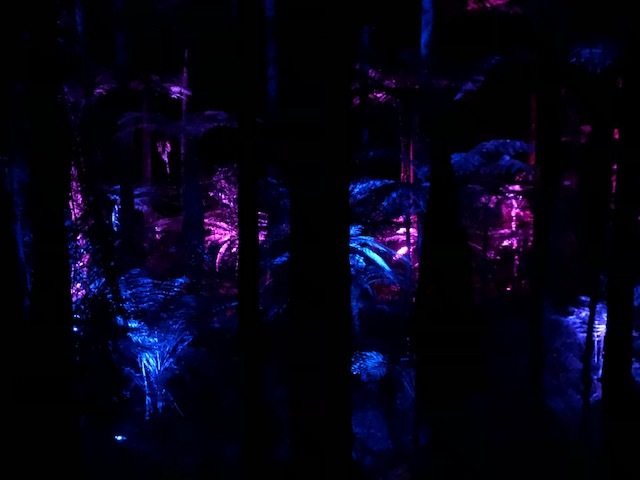 The forest was is a must-see for us in Rotorua. 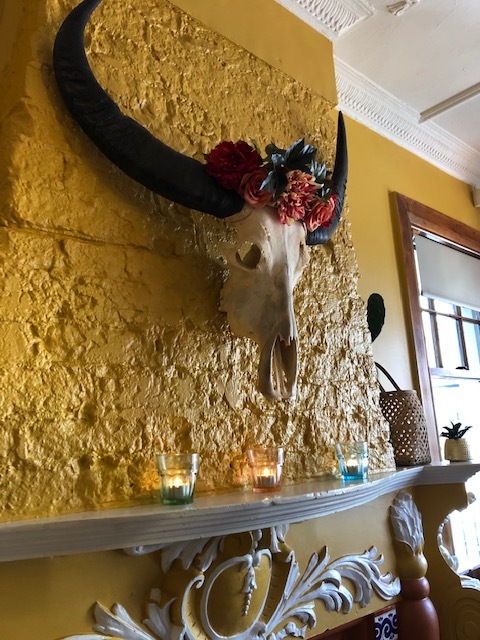 As much as we loved Sydney – and we absolutely loved Sydney – the summer heat and humidity there about did us in. When I climbed on the train out to the airport at 8:40 a.m. on the morning we left, I was quite literally already soaked through with sweat following the short walk from our apartment to the train station, with it dripping off my head and face onto the floor of the train. Everyone around me looked as cool as a cucumber while I felt like a very soggy human Las Vegas fountain. 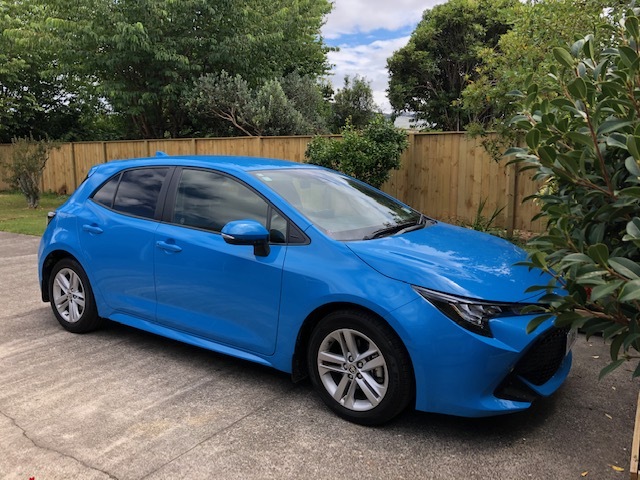 We had reserved a Toyota Camry but ended up with this bright blue Corolla . . . for $350 less and better gas mileage! We’ve nicknamed it “the Bluebird” – it’s always easy to find. Brett picked up driving on the left side of the road quickly (well, he had to). But, we got to the airport, got our bags checked, cooled off and eventually boarded our three and a half-hour flight to Auckland. We arrived on time at around 4:00 p.m., expecting to quickly pick up our bags, get our rental car and hit the road. But it was not to be so easy: Brett got pulled over by customs and had to practically unpack his entire suitcase to show that the little jars in his suitcase were really Oregon jam and not honey. That took a while, and then we had to wait for a van to come and pick us up and take us out to the car rental office, which was near to but not in the terminal. Everyone we dealt with was very, very nice, but by the time we finally drove out of the rental lot it was after 6:00 p.m. and we had a three-hour drive ahead of us. Thankfully, because New Zealand is so far south, it didn’t get dark until around 8:45, so we did get to see quite a bit of beautiful countryside on our way to Rotorua. We arrived at our Airbnb at around 9:15, met our very kind hosts, got settled into our room and fell right asleep. After a lovely breakfast the next morning, prepared by our hosts, we checked out the notebook of local sights and activities our hosts had prepared for guests and discovered that you have to pay (a lot) to view almost every site in the area, from natural wonders to Maori villages. Free activities were few and far between However, we did find a few interesting-looking places that didn’t charge admission, so we set off to check them out. 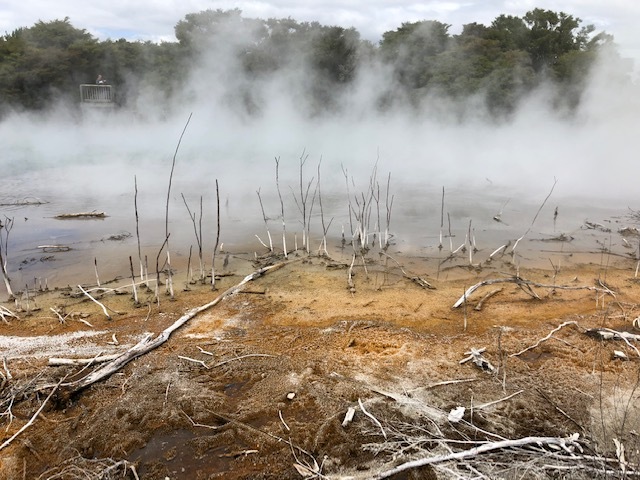 Our first stop was Kuirau Park in downtown Rotorua. 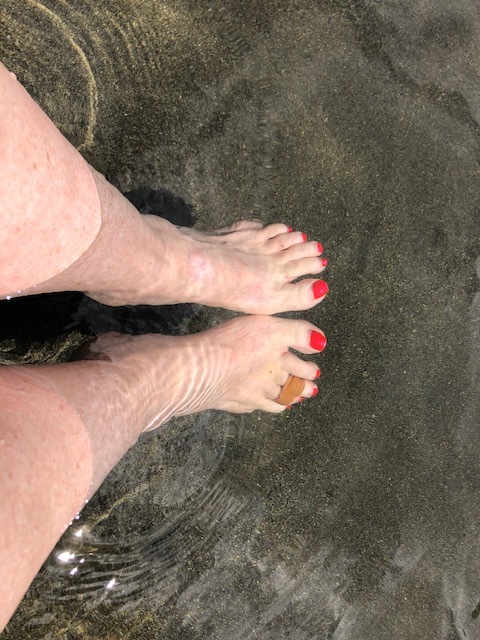 Kuirau Park had two thermal pools where you could soak your feet – heavenly. My broken toe loved it. 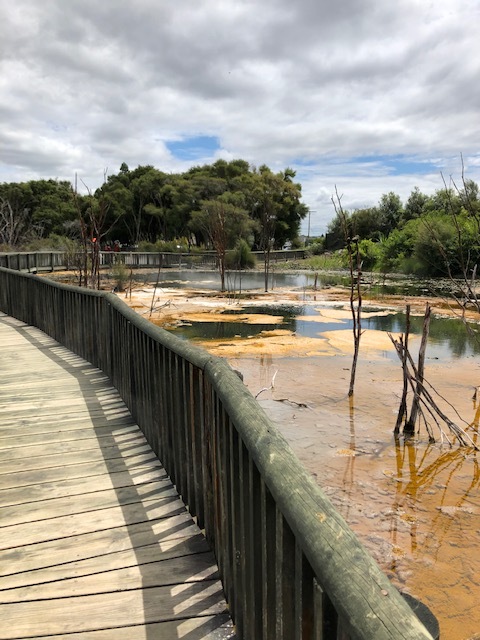 We approached the large, boiling pond that sits in the middle of the park . . .
. . . and then walked across the bridge that spanned the pond. It was like walking through hell -sulphur, heat, steam, and everything around was dead. The far side of the pond looked even more dead than when we started, if that was possible. We could smell sulphur the moment we got out of our car at the park, and noticed lots of steam coming out of the ground in different places, as well as lots of low brown fences which surrounded the steam. Fairly soon we were walking around pits of boiling water or mud, or listening to water furiously bubble and hiss beneath piles of rocks. It was fascinating! Eventually we reached a rather large pond of boiling water with a low bridge across it. Crossing the bridge was, I thought, like walking through hell, with its smell of sulphur, dead trees all around, clouds of steam blowing across the water, and moist heat rising up through the planks of the bridge. And, all of this was right in the center of town! There were also large area of grass where we could see small pools beginning to form, and just outside the park and across the street was a motel that had apparently just sprung a leak because there were big clouds of heavy, angry steam coming through its fence out to the sidewalk. The traditional Maori meeting house. The designs on the eaves and over the door were made with shells. No one can enter without an invitation. 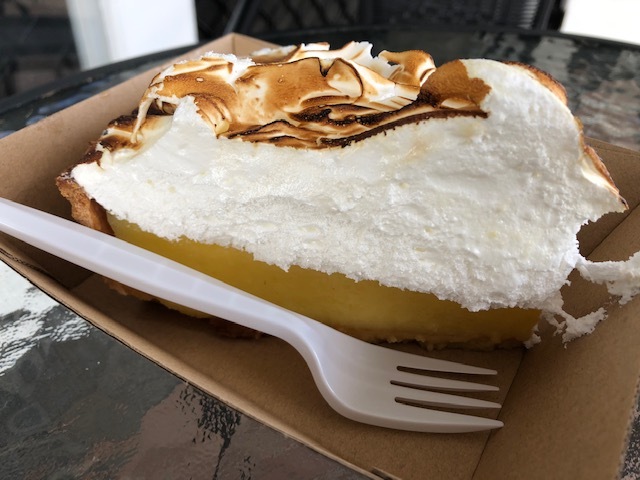 Brett and I shared a big, wonderful slice of lemon meringue pie at a bakery near the lake. 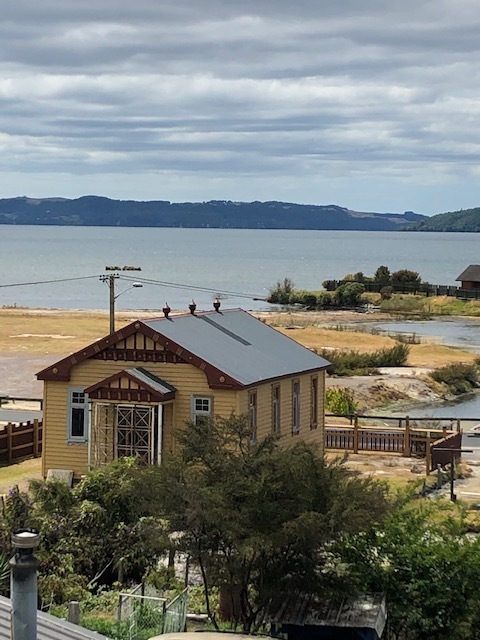 From the park we walked up and looked out over Rotorua lake, and down to a Maori village that sits by the lake, in particular to see the traditional meeting house which is decorated with shells. We could have walked down into the village, but it’s not a place set up for tourists or visitors. We stopped at a small bakery nearby though and shared an amazing and affordable piece of quiche and big slice of lemon meringue pie for our lunch. 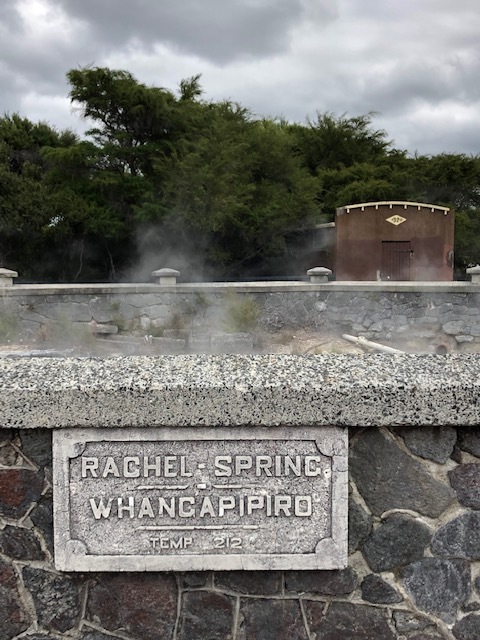 Rachel Spring was tapped in 1920. Note the water temperature: 212 degrees, or the boiling point. Back when Government House was a spa and bath house, men stayed in one wing, women in the other. There was a restaurant and lounge in the middle. No architectural detail of any kind was avoided or left out in the construction of Government House. After lunch we headed over to Government Park especially to see Government House, so called these days only because it sits in Government Park, not because it was ever the seat of government. 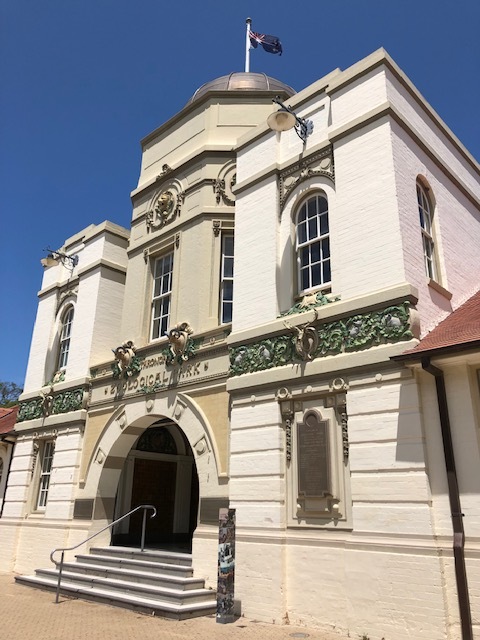 Actually, it was constructed as a large spa back in the late 19th century, and had thermal waters piped into private bathrooms throughout the hotel. The spa, or bath house, also contained large pools for more complex therapeutic needs, and guests could also receive hot water, high pressure shower massages. 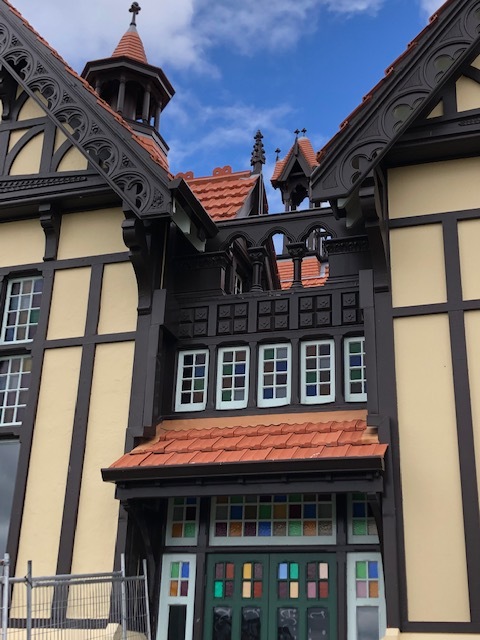 The architecture of the place was a frothy mix of several architectural styles from gingerbread to cupolas to leaded glass to half-timbering. Out front were lawns for croquet and bowling. Locals and guest still swim daily in the Blue Baths’ huge thermal swimming pool. It was built in 1933, and the interior is full-on art deco. It remains a popular spot for weddings and other events. Nearby was the famous Blue Baths, built in 1933 so both locals and spa guests could swim in hot, therapeutic waters. The Blue Baths were infamous for a while as the first place where men and women shockingly swam together at the same time in New Zealand. 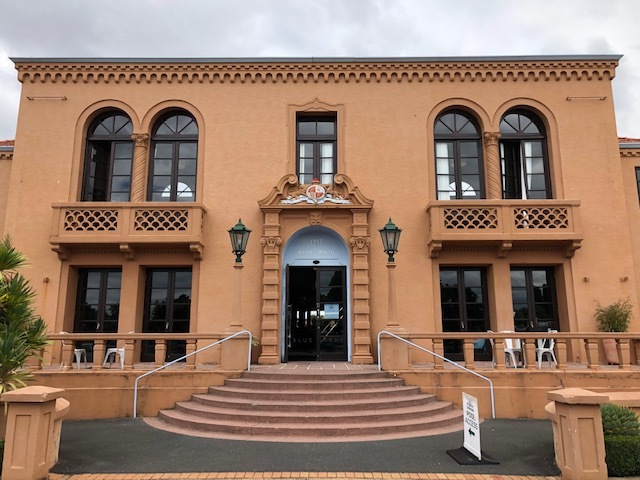 Both Government House and the Blue Baths are listed on the New Zealand historic register (as is nearby Rachel Spring, where all the hot water come from), and Government House now holds the Rotorua Museum. We came back to our Airbnb from that outing feeling a bit tired, but rested for a bit and then headed into town to eat at a highly-rated place called Ali Baba’s, which served Tunisian food. Our dinners were some of the best food we have had since we began traveling – fluffy rice with falafel, tasty sauce and fresh salads – and the price was pretty good too, with our two huge plates of food and some baklava costing less than $25US. The spiral path up to the suspended bridges and tree platforms for the night walk. A couple of the artistic lanterns hang above. The giant hanging lanterns were designed and made by a local artist using resin made from recycled pine trees. At one stop, the giant ferns on the ground were lit from underneath – gorgeous! Then it was out to the Redwood Forest to experience the night walk through the trees. 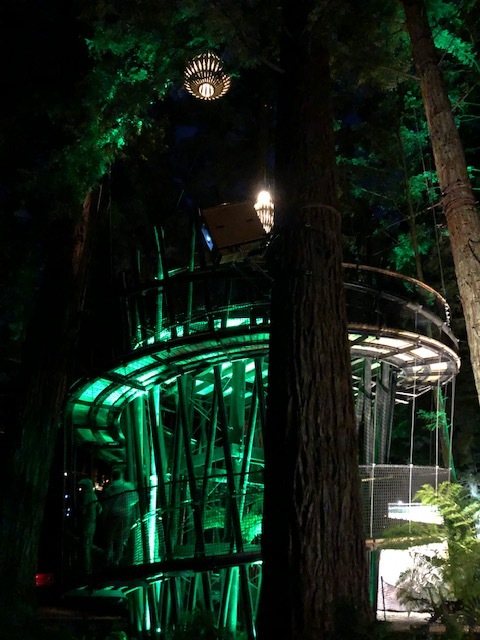 We paid $20US each, and for around 50 minutes we walked from platform to platform in the trees in the dark on suspended bridges high above the forest floor. Each platform contained information about the redwoods and the forest. 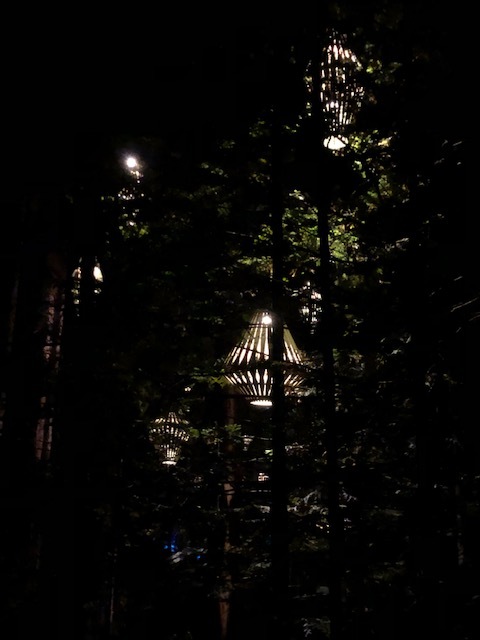 Large, artist-made lanterns, fairy lights, holograms and other types of lights decorated the forest – the experience was absolutely magical, and we left feeling very glad that we had decided to go. 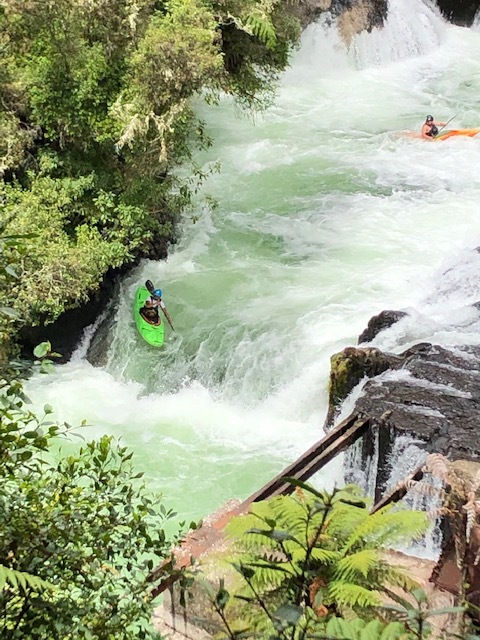 A kayaker drops down over Okere Falls, but the guy behind him didn’t do as well and got tossed around a bit until he finally got himself righted. This section of the falls was the site of a hydro-electric power plant for a while – the remains can be seen in the foreground. A white water raft shoots through one of the lower falls. The rapids through the area are Class V.
We slept in this morning, and at around noon drove up north to visit Okere Falls (because they are free to visit!). 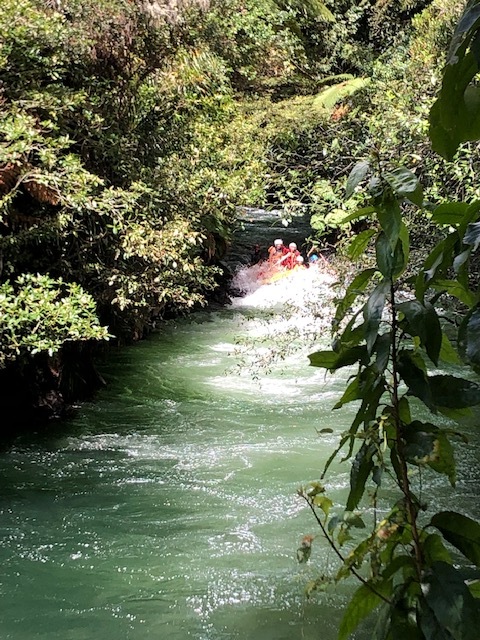 We were able to watch kayakers and a raft or two, loaded with people, go over the falls. The 22-foot high waterfall is said to be the highest commercially rafted waterfall in the world. We ended up doing quite a bit of hiking in the area when we took what appeared to be a short loop trail and instead had to walk nearly two miles through the woods to get to the other end. 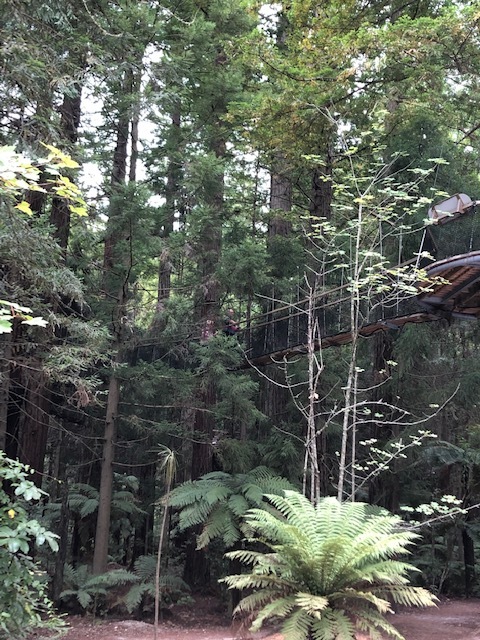 Our first stop at the Redwood Forest was to check out the bridges we had walked on last night and were surprised that we weren’t as high up as we had thought we were. We also could find none of the lanterns – during the day they are disguised and hidden in the trees. California redwoods are the tallest trees in the world. These towered above us, and yet are mere babies compared to the ones in California. 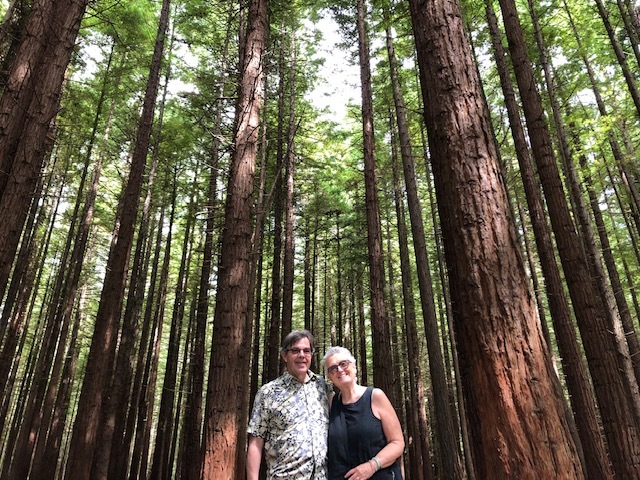 We learned last night that “New Zealanders love their ferns” and the Redwood Forest is filled with them, many of them quite large and towering high above the forest floor. Leaving the falls we took a short drive back to the Redwood Forest to see what they all looked like in the light. 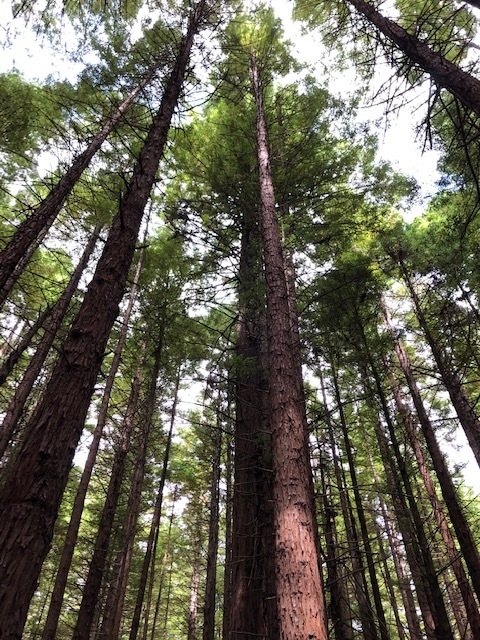 The redwoods came from California, and were planted in 1900 – New Zealand is the only place outside of California where they grow. 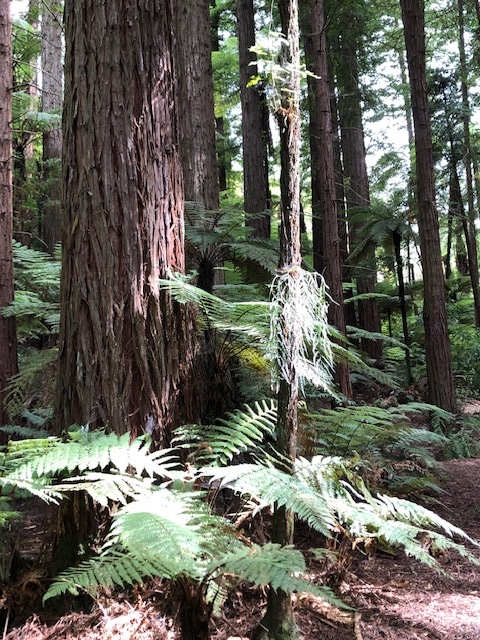 The forest was magnificent, with towering redwoods and huge ferns along the way, and there are several different hiking trails to choose from, depending on how far you’d like to walk (we chose the shortest, supposedly 30 minutes but it took us more like 45). The trees are nowhere near as big yet as the ones in California, but give them a few hundred years and they will be! 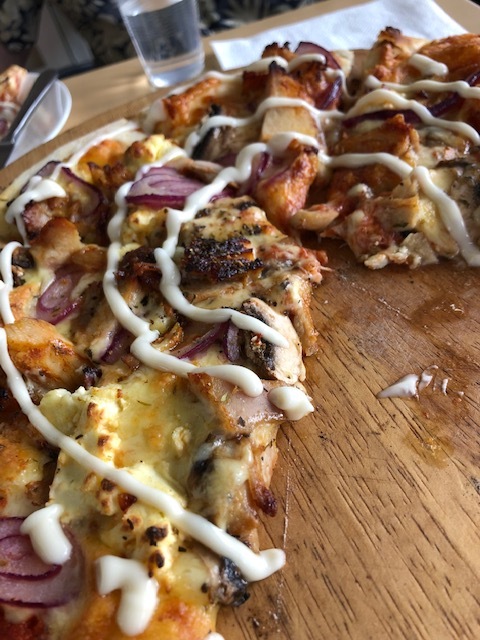 Tunisian pizza at Ali Baba’s – who would have known that apricots and cream cheese on a pizza would taste so good? Dinner tonight was back at Ali Baba’s, where we shared an extremely delicious Tunisian pizza topped with chicken, apricots and cream cheese among other toppings. It sounds weird but it was fabulous. Our big pizza was just $12, and we still have half to take with us for lunch on the road tomorrow. We’re heading to Napier tomorrow, located on the south coast of New Zealand’s north island. 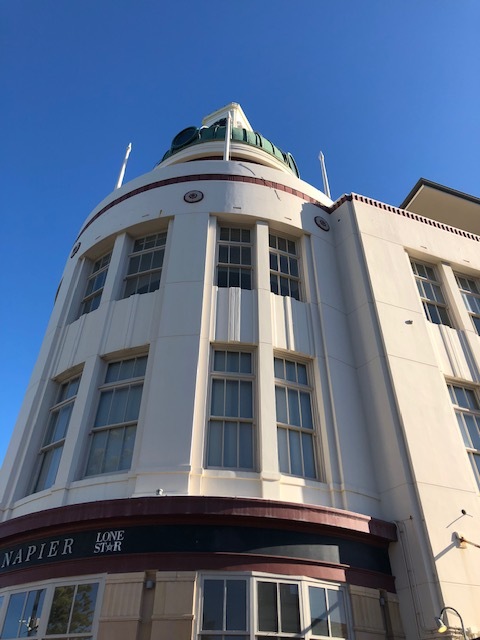 We’ll stop to visit some more waterfalls on the way, and hope to get into town early enough to stroll around to see Napier’s most famous site, an amazing collection of art deco buildings located throughout the downtown area. We can’t wait! 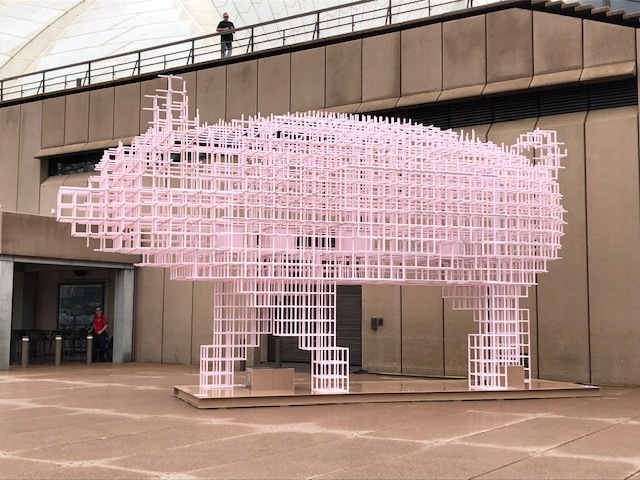 Our guide at the Opera House called their Chinese New Year’s decoration “the quadratic pig.” I don’t think that’s the sculpture’s real name, but it stuck with us. Gong xi fa cai! Xin nian kuai le! Happy New Year! Welcome to the Year of the Pig! Our time in Australia has absolutely flown by. It seems like just yesterday that we were in Hong Kong, and yet sixteen days have passed since we arrived in Perth: six days there, four days on the train, and another six here in Sydney. It’s been an amazing time, and yet we know we’ve only scratched the surface of this big and fascinating country. We were very hot and tired at the end of our zoo visit and more than ready for a cool ride back across Sydney Harbor on a ferry. For the most part it’s been very HOT while we’ve been here, from beginning to end. We knew we were coming to Australia in height of their summer, but we (me especially) were honestly not prepared for the blazing sun, high temperatures and the humidity (once we hit Sydney). Still, I’ve never seen skies so blue and have loved being out on and near the water once again – the trade-off has been worth it. The original main entrance to the Taronga Zoo was impressive, but visitors now enter through a more modern gate. 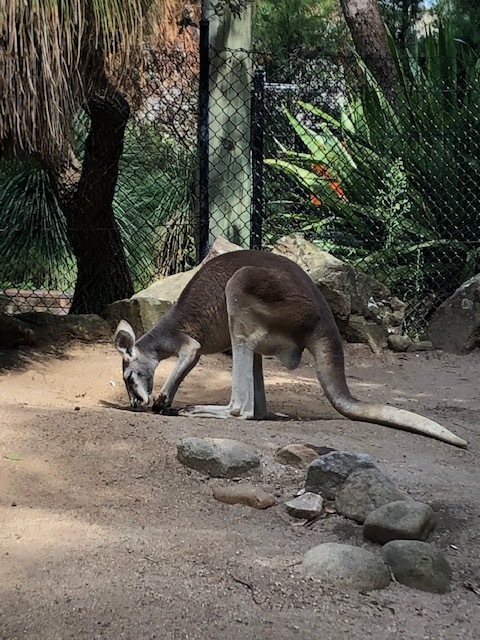 We traveled over to Sydney’s Taronga Zoo yesterday to check out their collection of Australian animals, excited to see ones we had only previously seen in books, and were not disappointed. Taronga (an Aboriginal word for “beautiful view”) was a wonderful, well-planned zoo, set up high on a hill with a sweeping overlook of Sydney harbor, and with well-designed animal enclosures. The zoo is good-sized without being overwhelming, and has an Australian “walkabout” area as well as a koala walkabout and a reptile section containing giant monitor lizards, crocodiles, and snakes both (highly) poisonous and not (there are also a few SE Asian and African animals, but we did not go over to see them). We arrived just a few minutes late for the koala encounter, where I believe I could have held one of them (swoon), but we still got a very good look at them. Koalas are just as adorable as you think they will be. 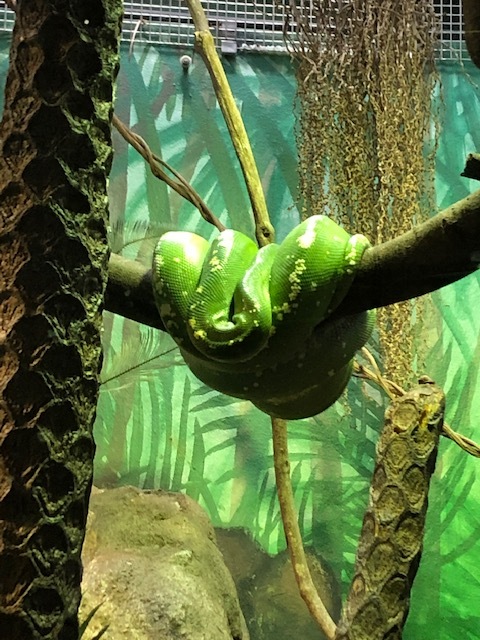 The green python was in the traditional python pose. I don’t like snakes, but I loved the color of this guy! A kangaroo slowed down long enough to pick up a stick to gnaw on – they were very active. The nocturnal animals were of course asleep, and the platypus and echidnas were hiding the entire time we were there, but otherwise we got a good, fairly up-close look at many fascinating animals. 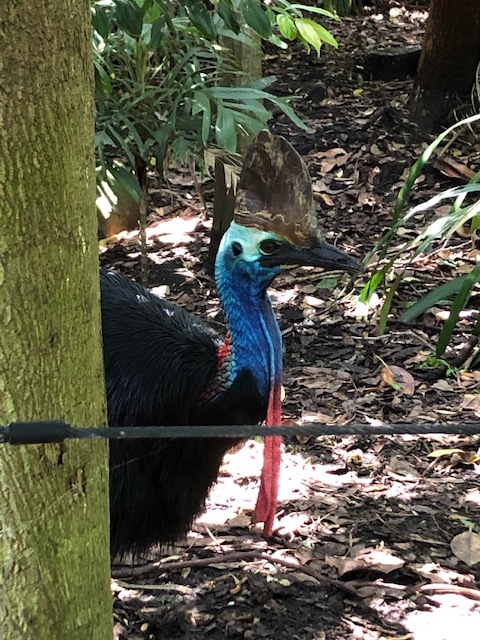 My favorite, after the koalas, was the southern cassowary, the third largest bird in the world, and the bird most closely related to its dinosaur ancestors. The big one we saw yesterday was gorgeous and he knew it. Mr. Gorgeous. The colors on his neck and head were extremely vibrant. He was also one very big bird. 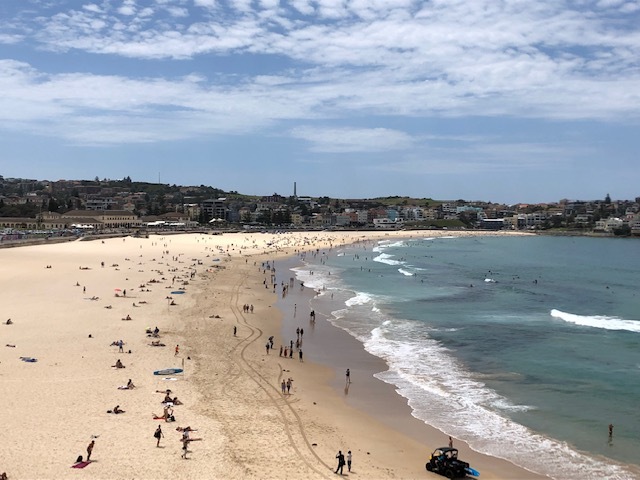 For our last day’s activity we took the train and bus over to the famous Bondi Beach this morning and took a hike along the coastal walk path to check out the ocean views. 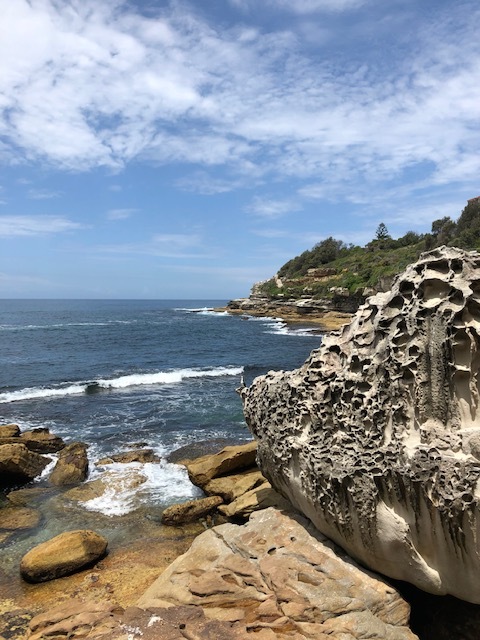 This morning’s weather was cool and slightly overcast in Sydney (although with high humidity), but by the time we got to Bondi the sun was out in full force and once again the humidity was pushing the limits (it’s been worse here in Sydney than back on Kaua’i). 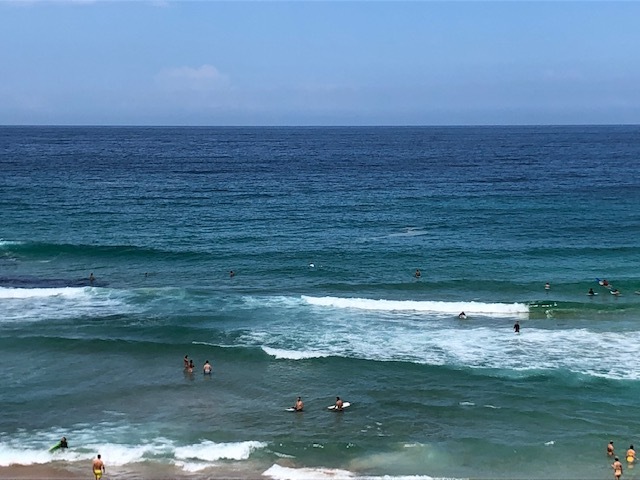 We walked as far as Bronte Beach, with a stop to share a grilled chicken sandwich for lunch at Tamarama Beach, at a spot overlooking the beach. There was a breeze as we walked, but it came and went, and unfortunately when it went away it was miserable, for me anyway. From Bronte Beach we caught the bus back to Bondi Junction, and then took the train to our neighborhood station. 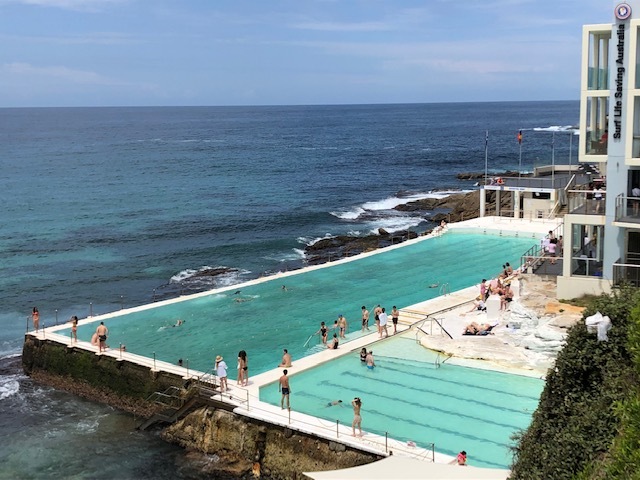 The public swimming pools at Bondi looked very inviting. 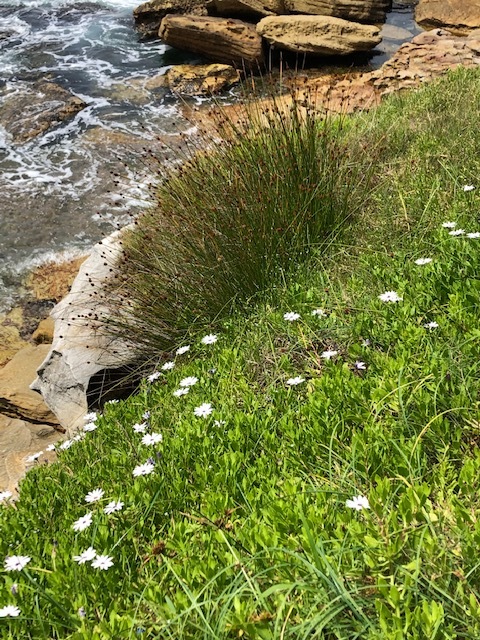 One of the many beautiful views along the coastal walk from Bondi Beach to Bronte Beach. This view, and the plants, reminded me of beach walks back in the day in Southern California. Lots of surfers were out today at the not-very-big Tamarama Beach. 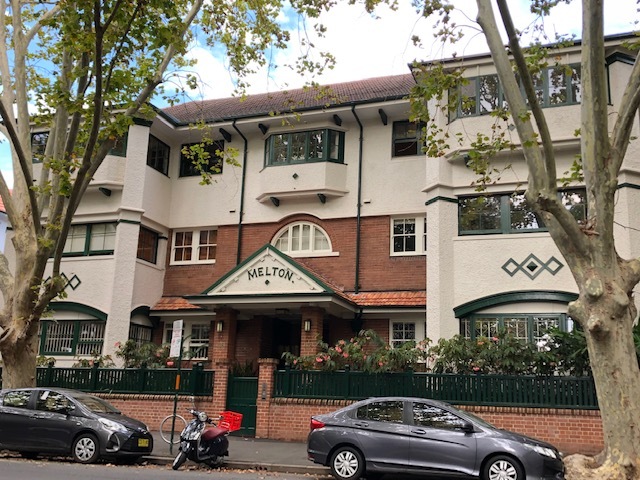 By the way, we have greatly enjoyed our apartment in the Potts Point neighborhood, a suburb to the east of downtown Sydney. The apartment is conveniently located, and we’ve had no trouble getting out and around from here. The area is filled with lovely older terrace buildings in between some modern buildings and even some art deco stuff as well and we’ve enjoyed walking around and looking at those. Some of the old buildings have been converted into backpacker lodging while others are being or have been renovated. 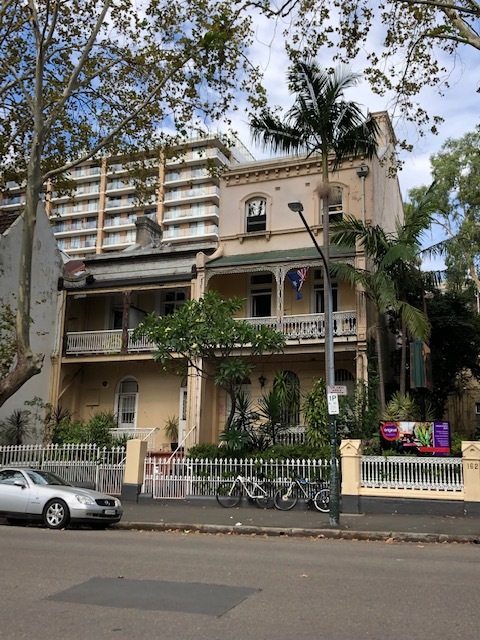 Potts Point sits up on a bluff from the Sydney harbor area and Wooloomooloo (try saying that fast!) neighborhood, so there are some rather daunting staircases to climb if you’re walking back. 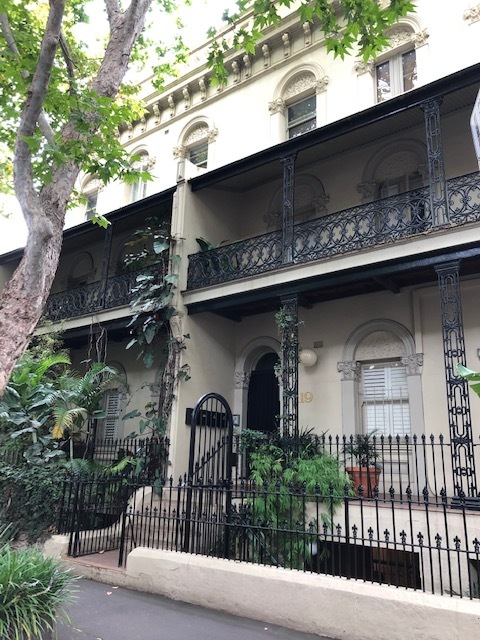 These two older terrace homes around the corner from our Sydney apartment have been turned into inexpensive backpacker lodging. A renovated terrace home – there is also an apartment below street level. 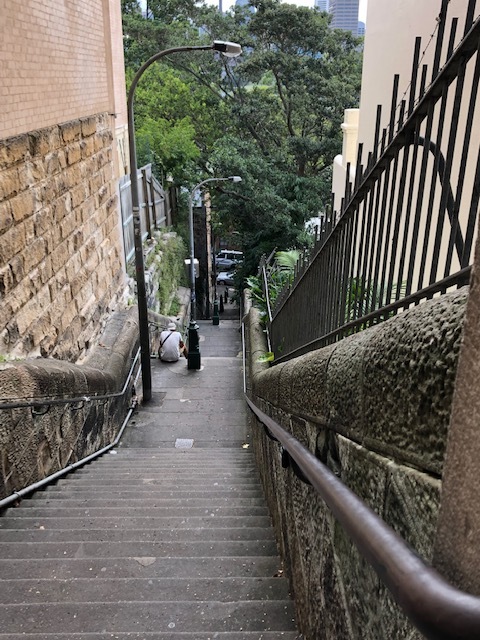 The Butler Stairs have 103 steps and connect the Potts Point neighborhood to Wooloomooloo below. We thankfully didn’t have to climb these stairs, but we loved the view from the top! Tonight we’ll finish our packing, and eat all of our odds and ends to clean out the refrigerator, making for a very weird dinner (remaining items include two eggs, half an avocado, a lemon, orange juice, wine, a few spoons of yogurt, some blueberries and some grapes). We’ve also got two lovely big slices of banana bread, but we’re saving those for our breakfast tomorrow as we’ll be up early to be on our way to the international airport for our flight to Auckland!